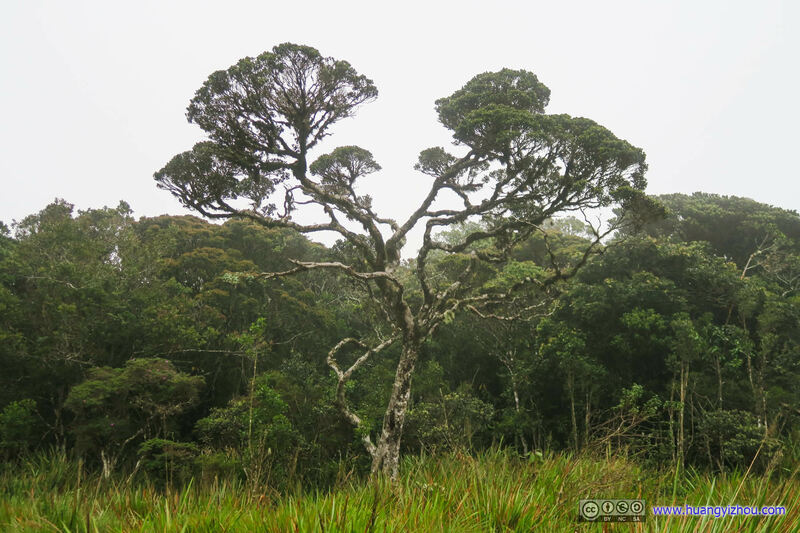 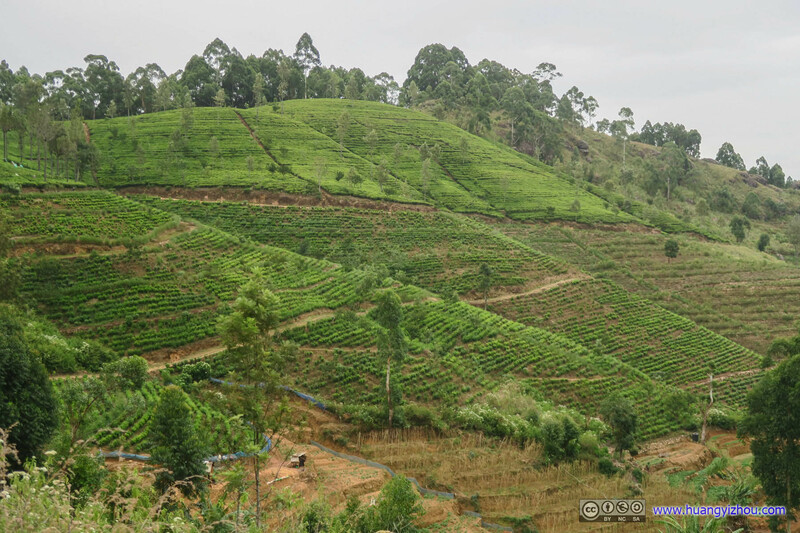 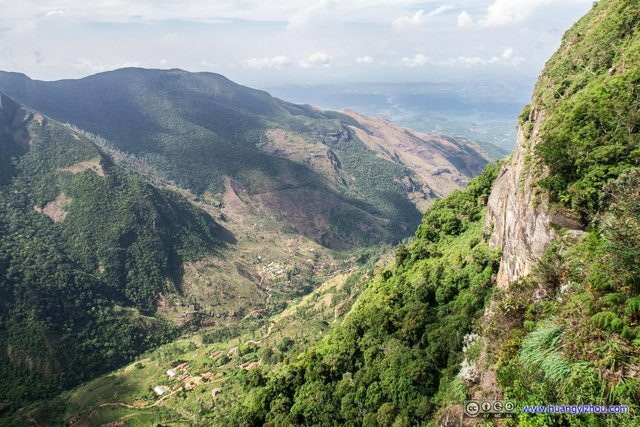 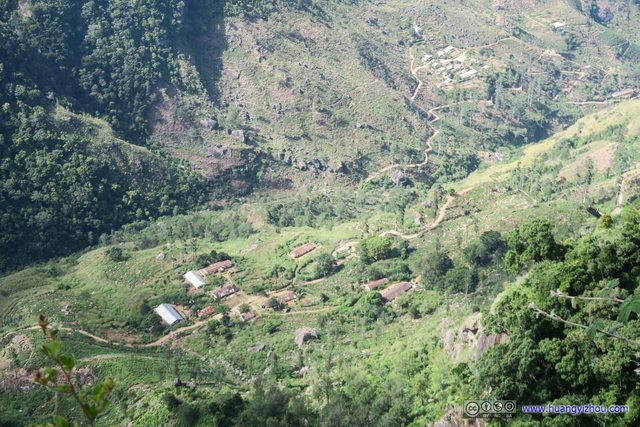 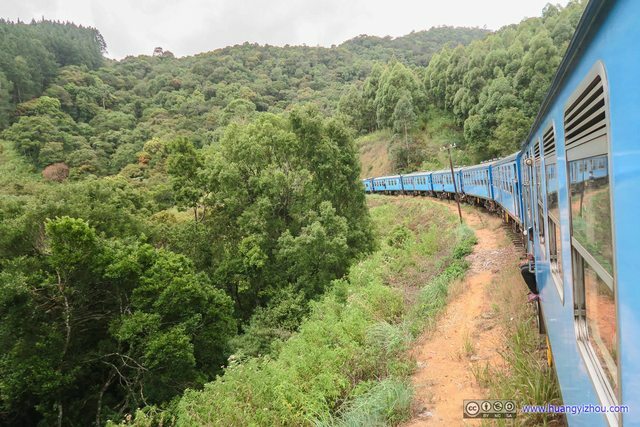 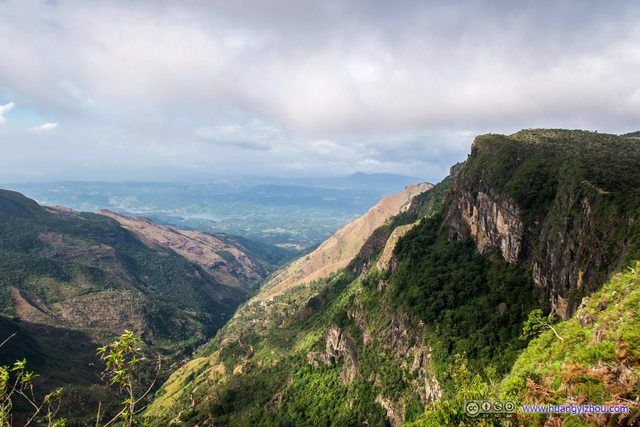 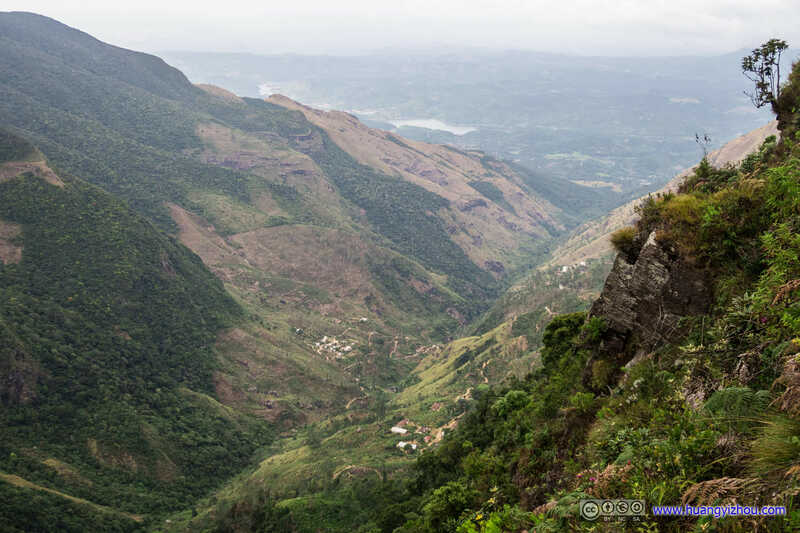 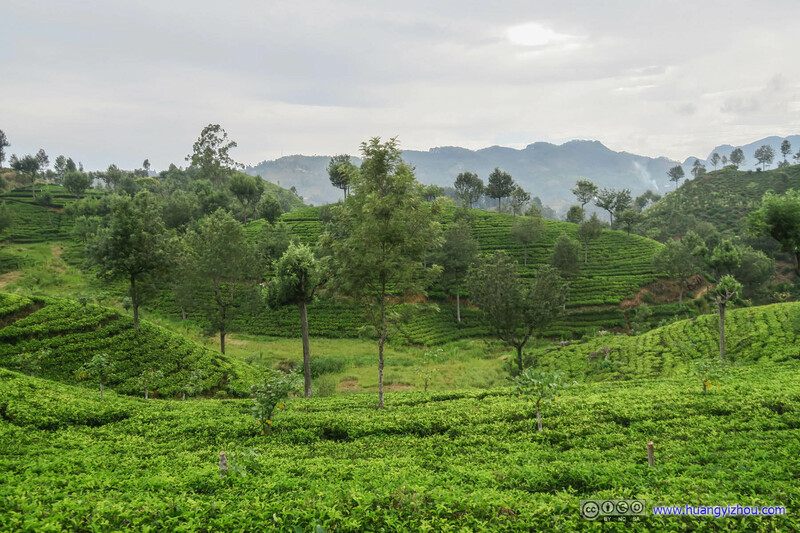 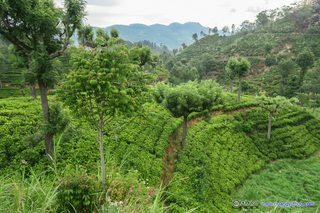 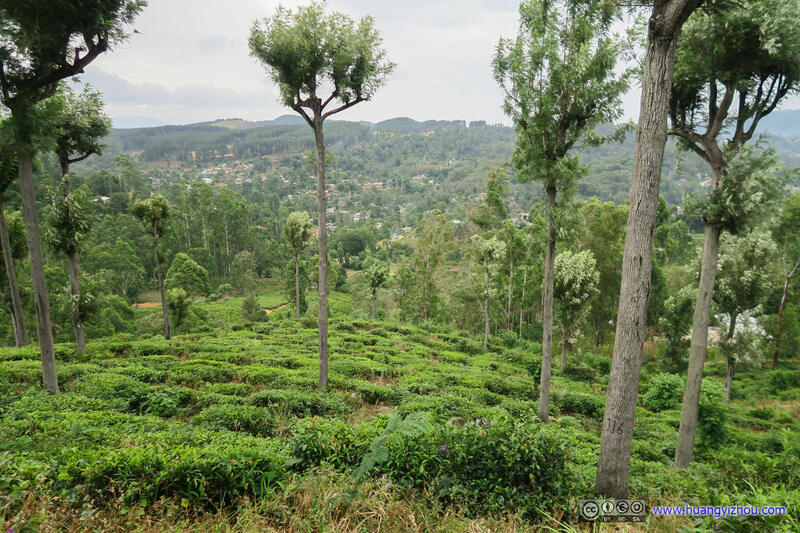 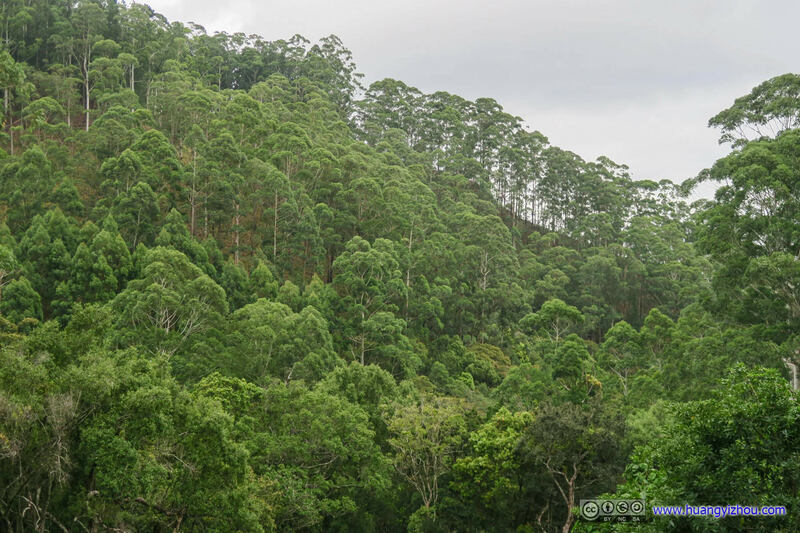 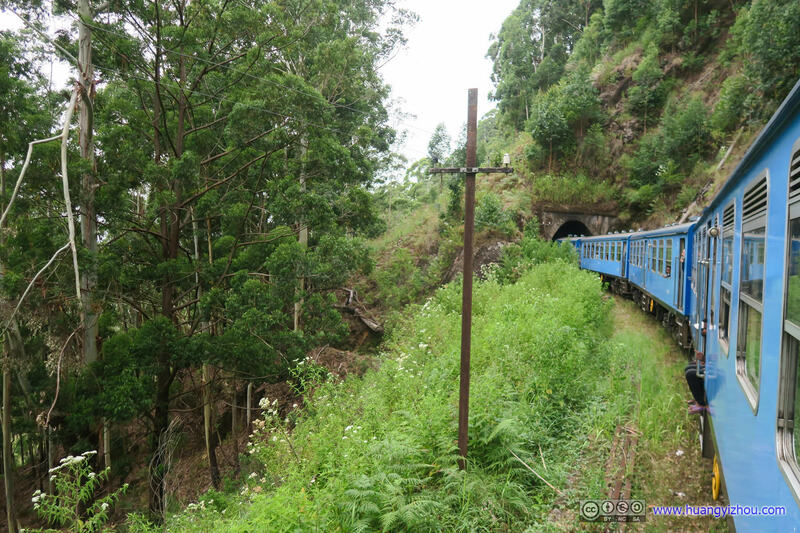 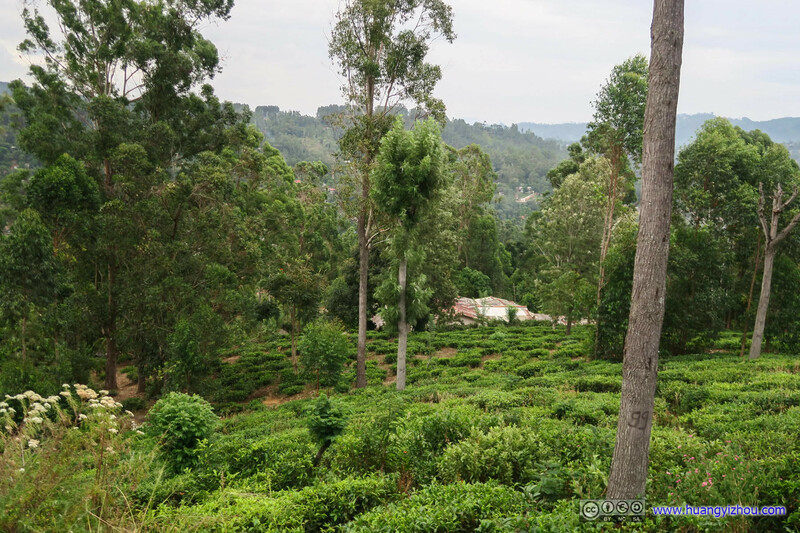 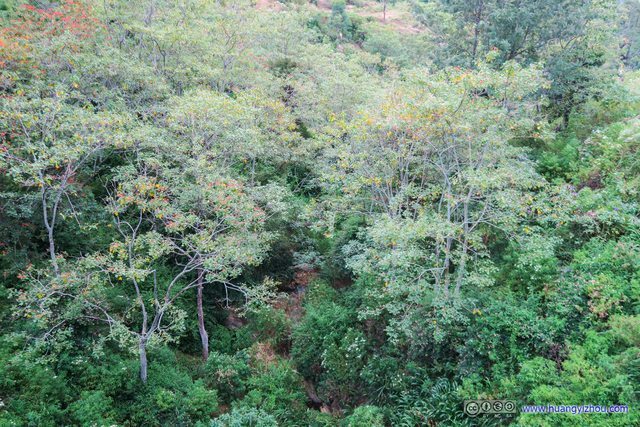 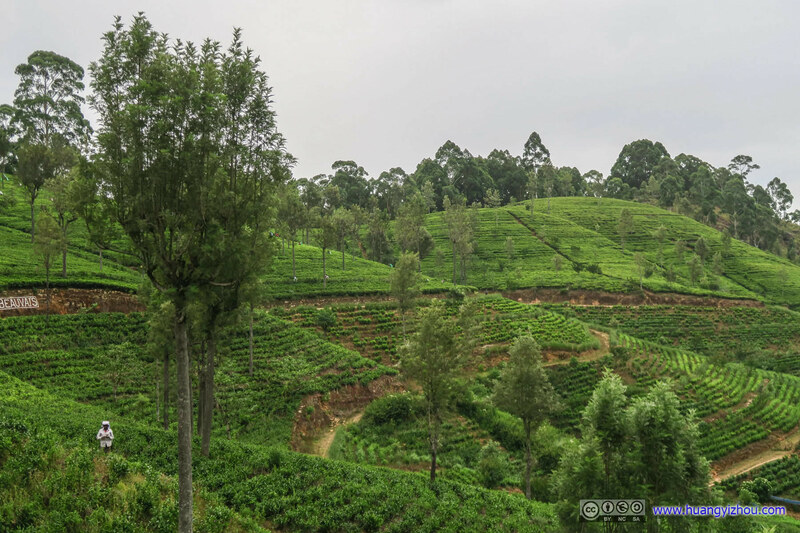 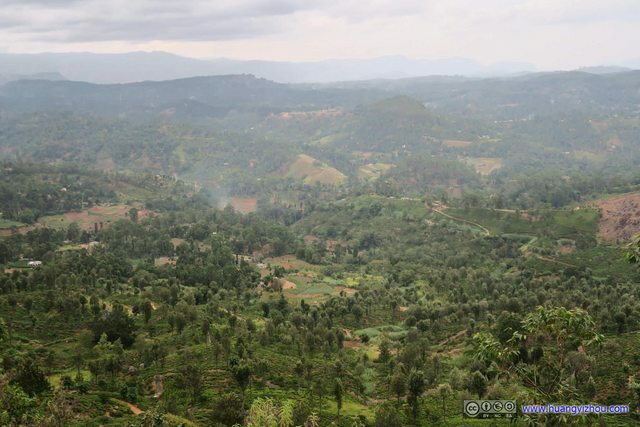 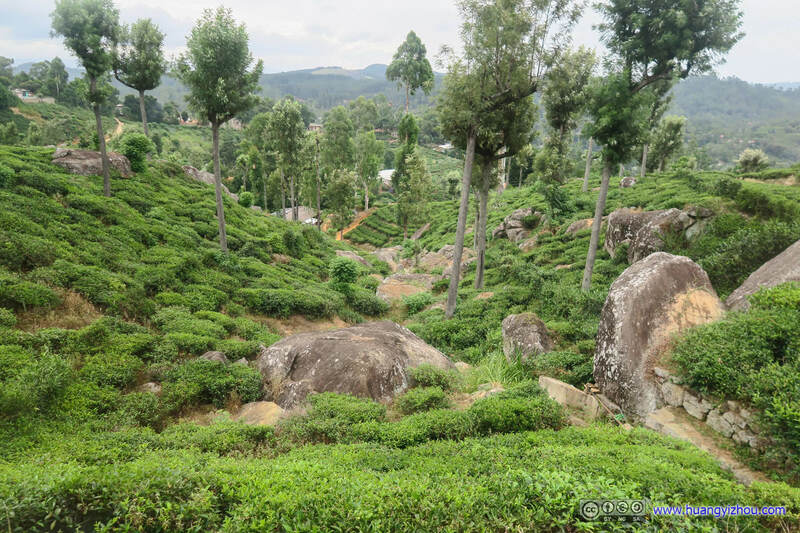 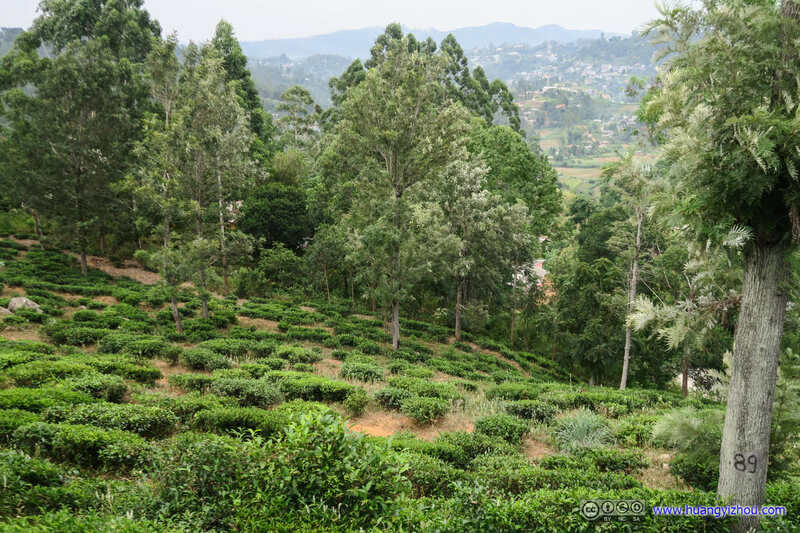 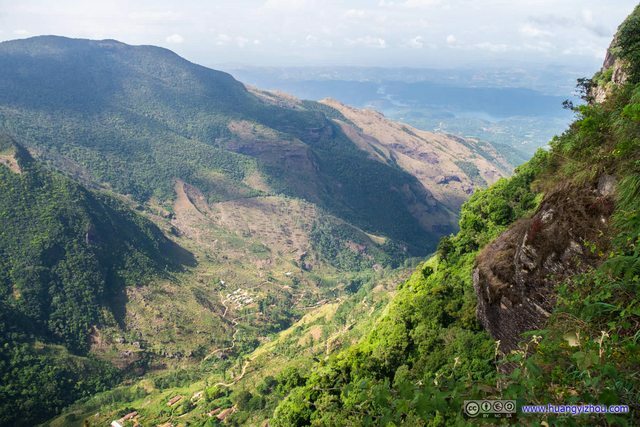 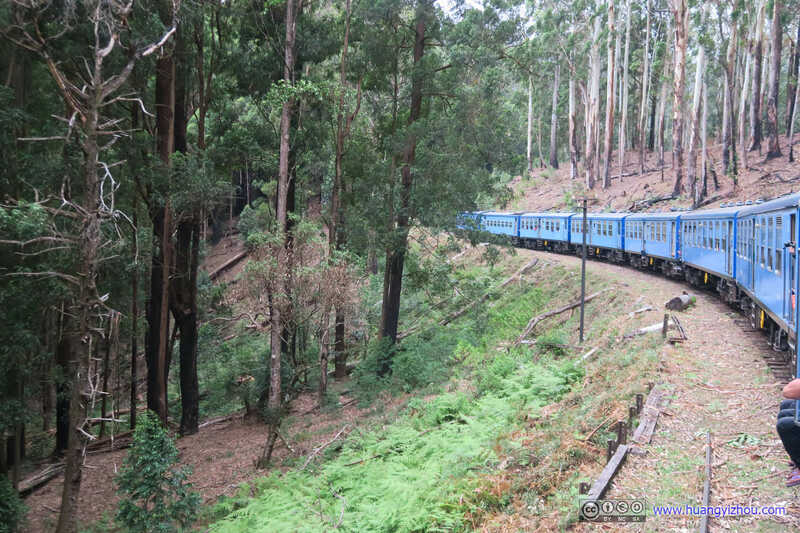 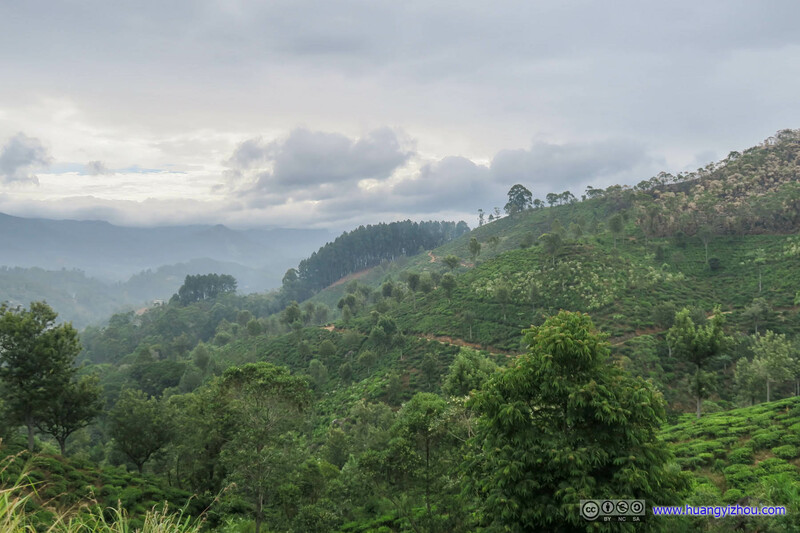 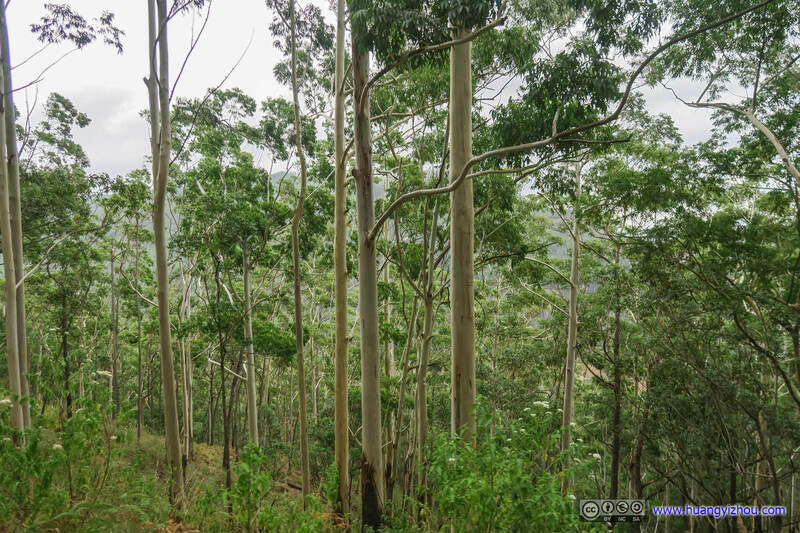 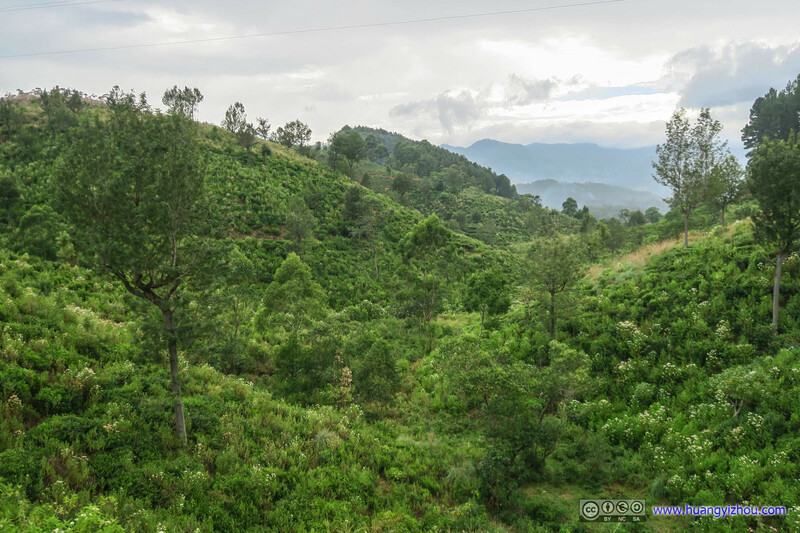 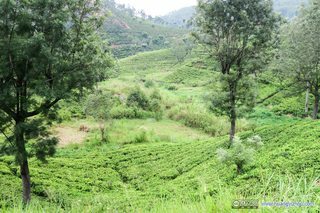 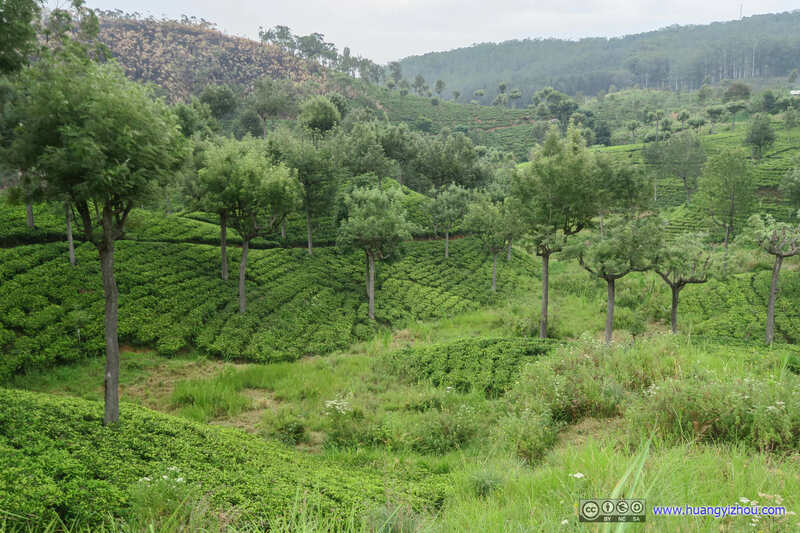 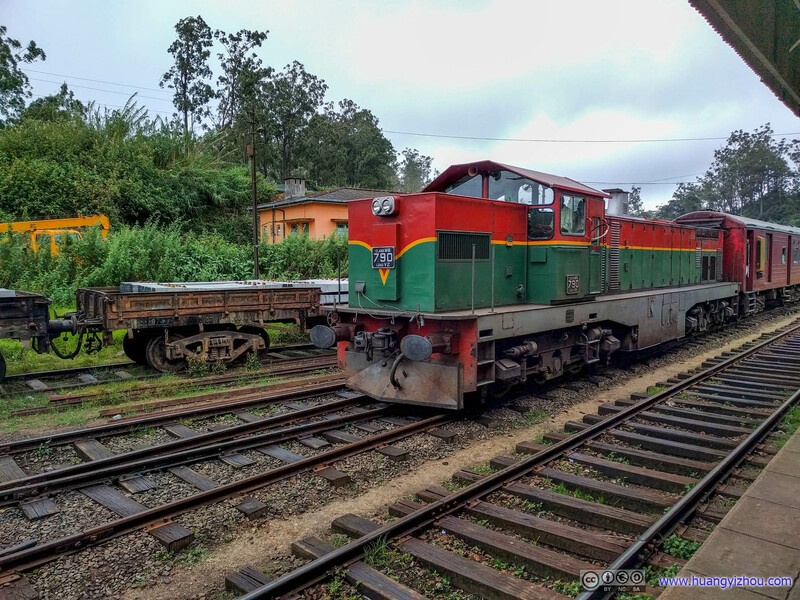 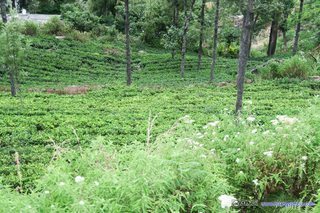 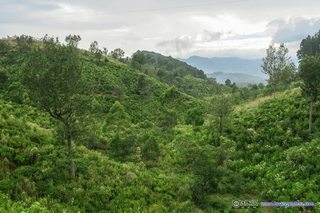 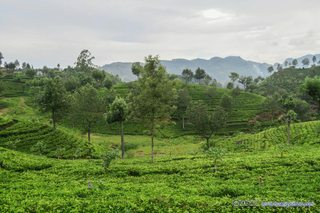 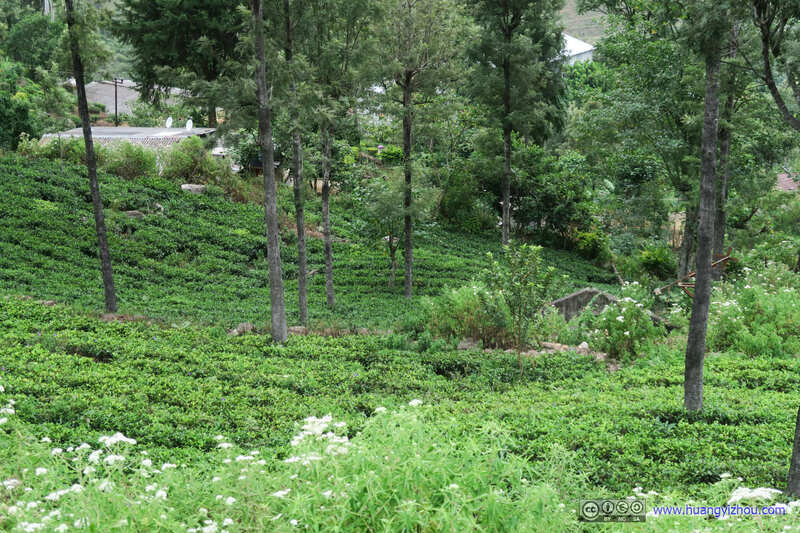 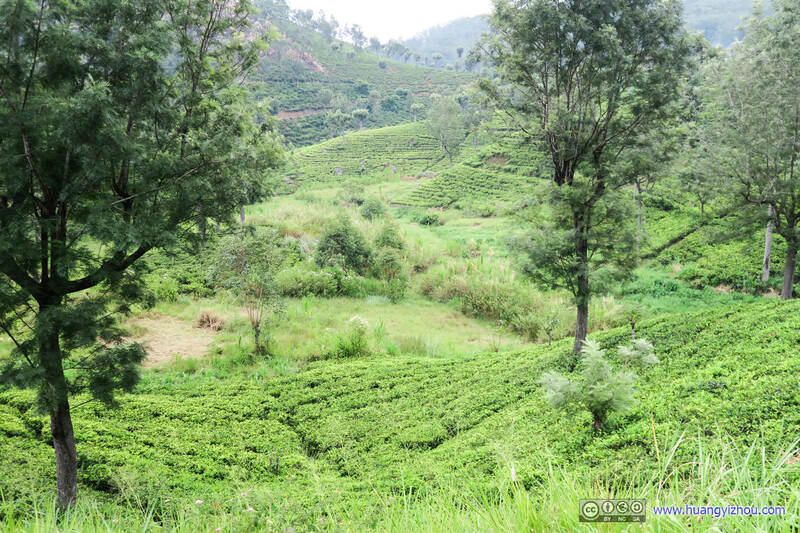 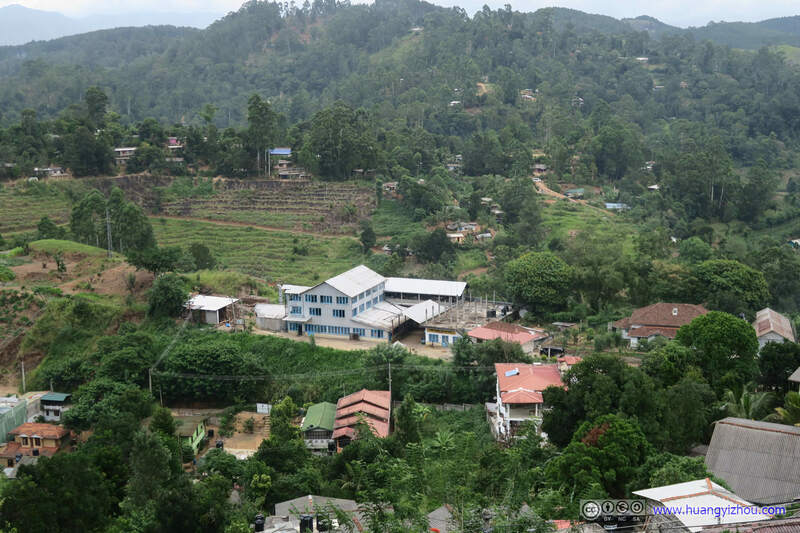 Ninth day of our Sri Lanka trip as we planned to hike the Horton Plains and take a train to Ella for the day. 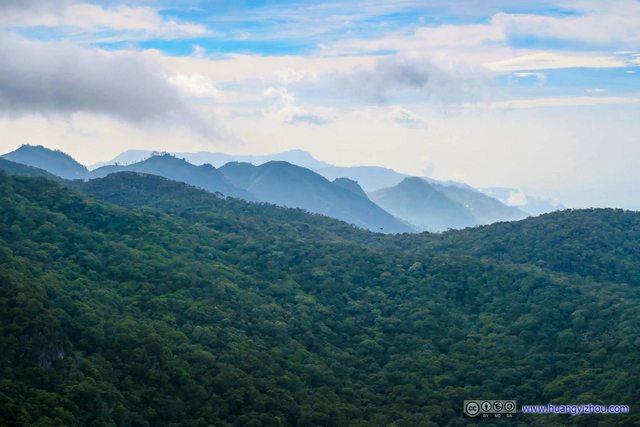 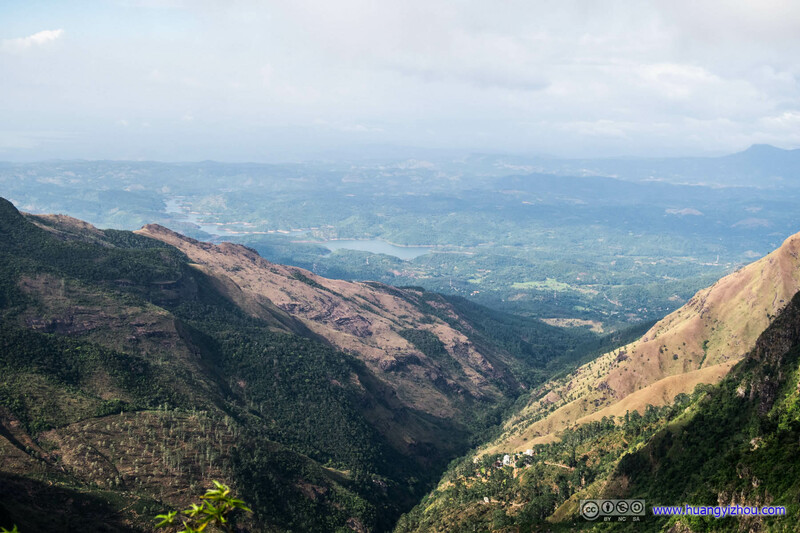 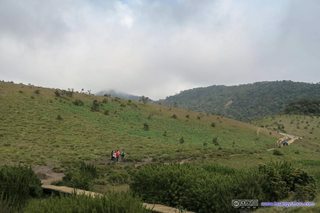 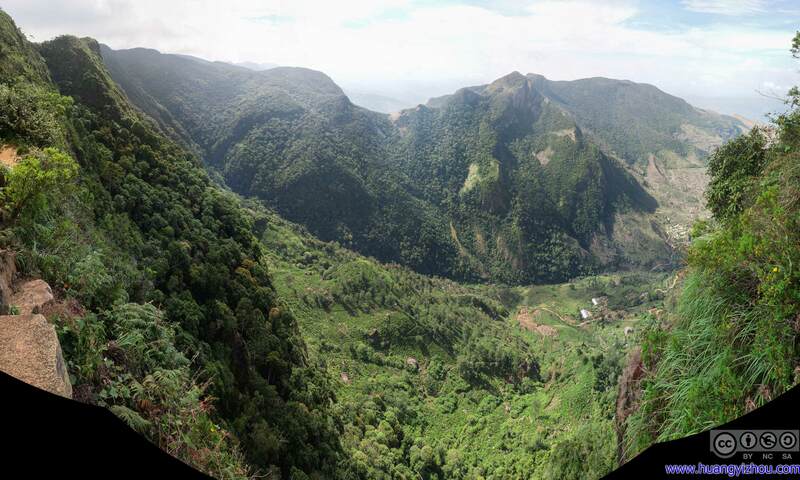 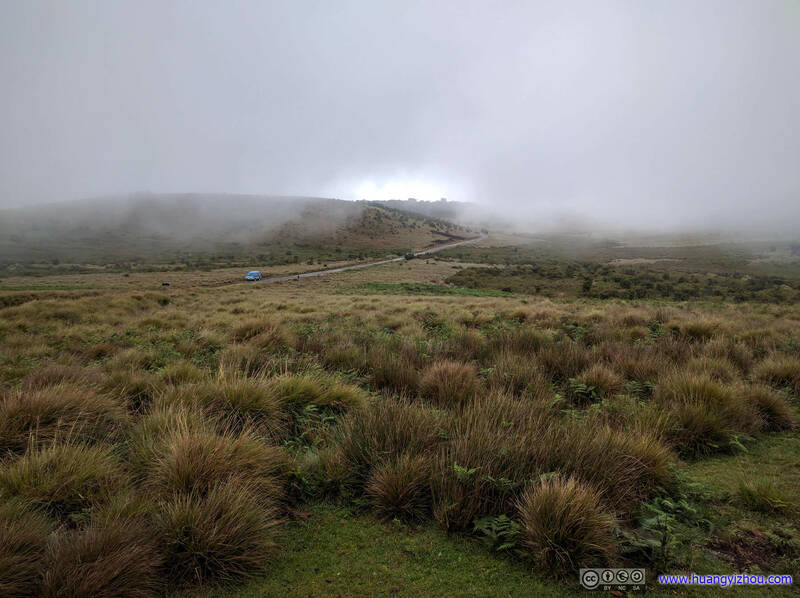 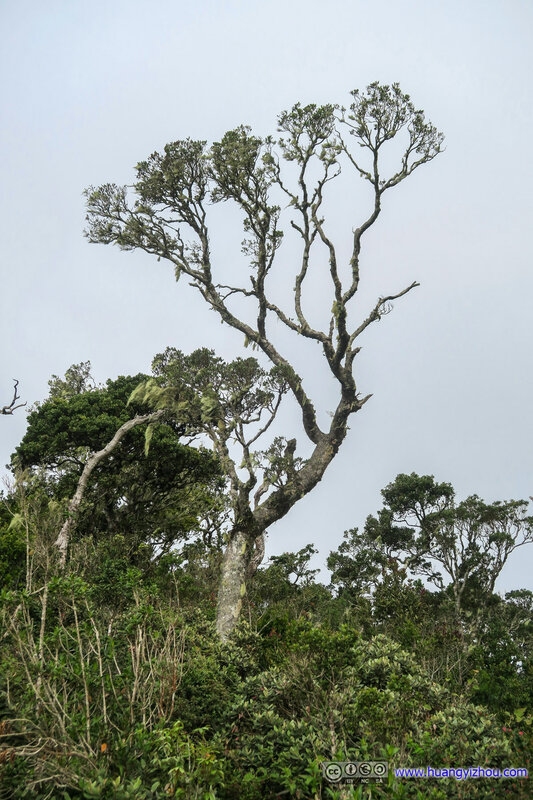 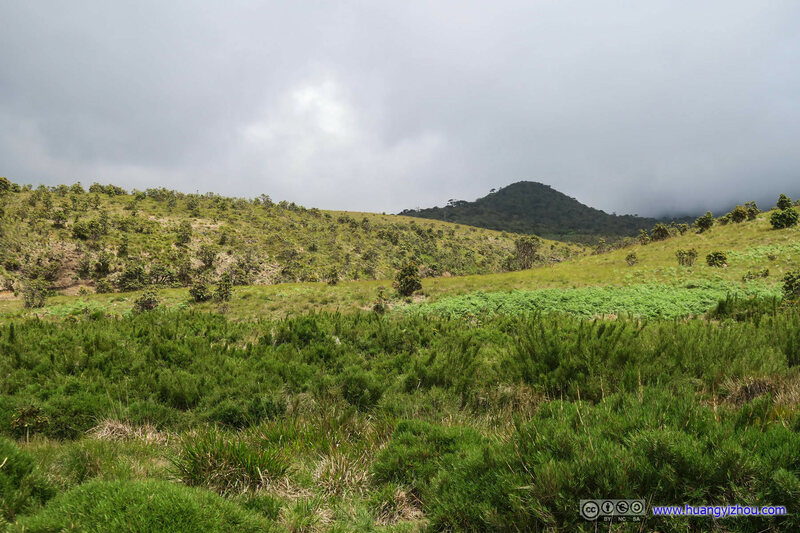 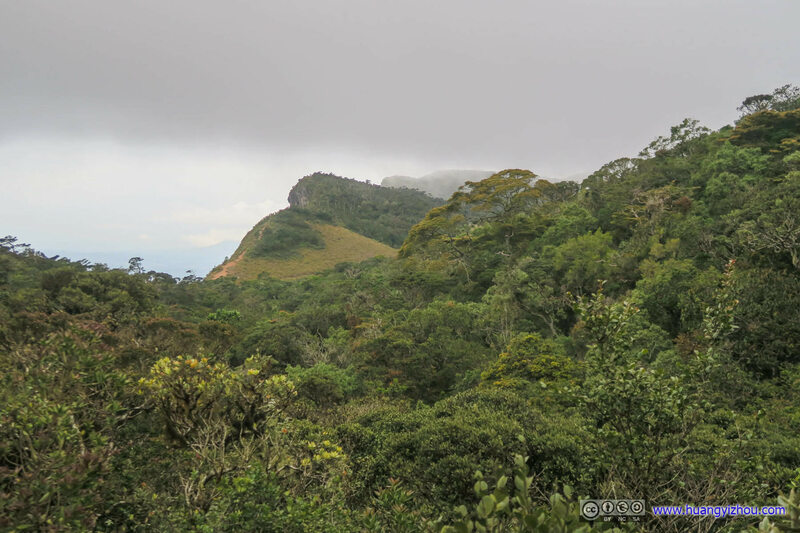 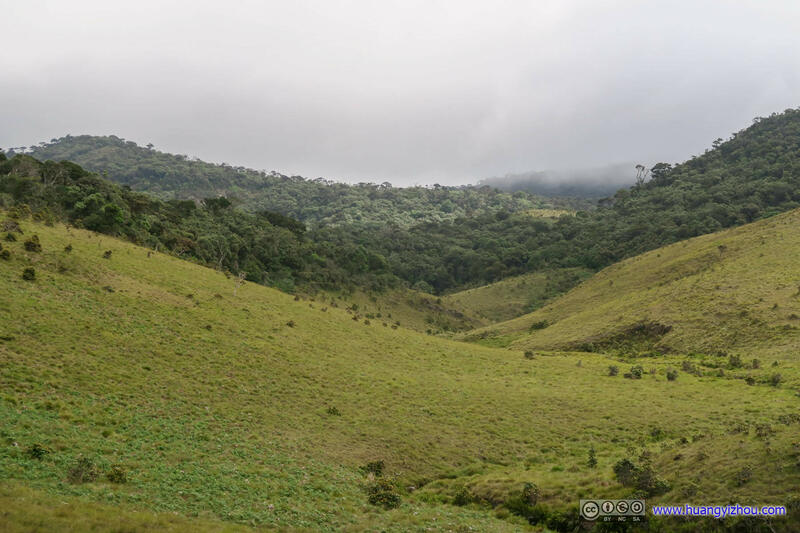 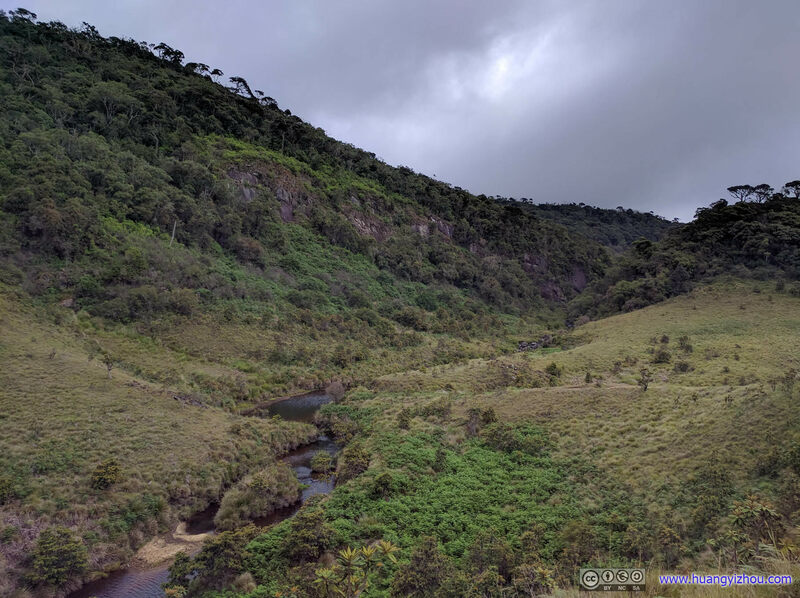 It’s said that the best time to visit Horton Plains was early morning before 10am, that’s when the clouds would roll in and block the views from World’s End. 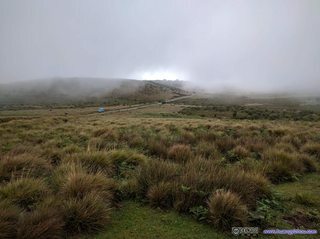 That means our misery journey started at 5am in the morning. 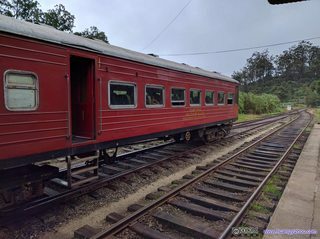 To make matters worse, the not-so-budget hotel that our driver helped us find had this weird way of cost-cut by cutting off electricity in the rooms early in the morning. 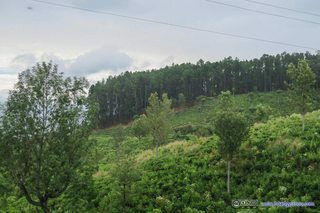 So we woke up at like 4:45 in the morning to our dismay in total darkness to find our cell phones and laptops not fully charged, but somehow we managed to pack our luggage with cell phone lights and departed this not-so-awesome hotel called Colling Wood at 5:15. Oh yeah, with breakfast though, some ordinary pieces of bread that’s only there when our driver woke the doorman. 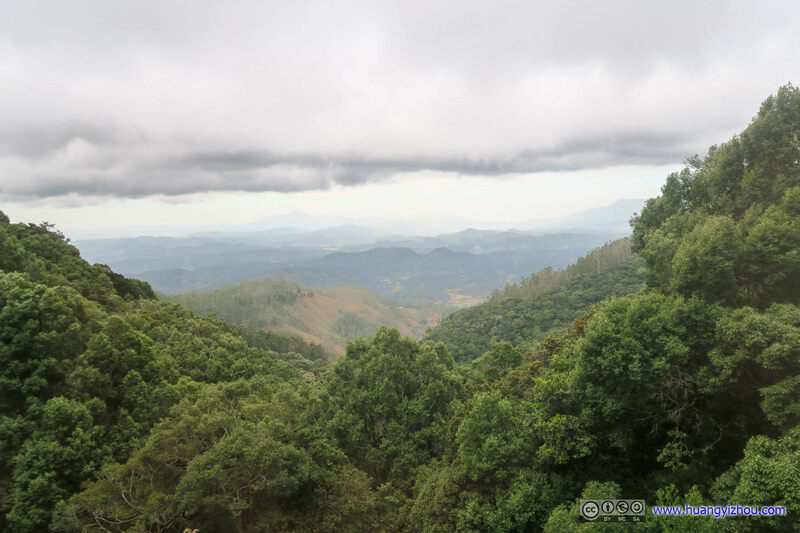 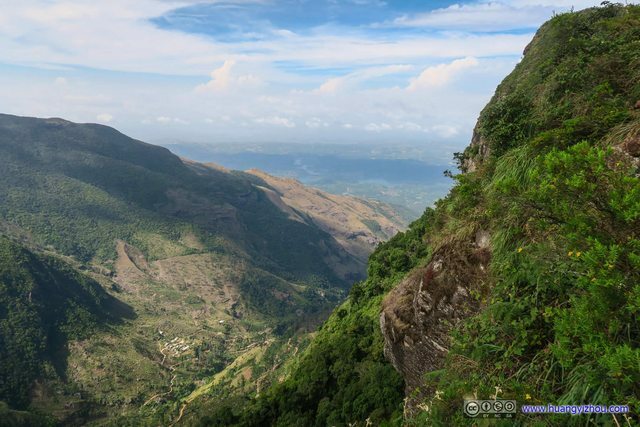 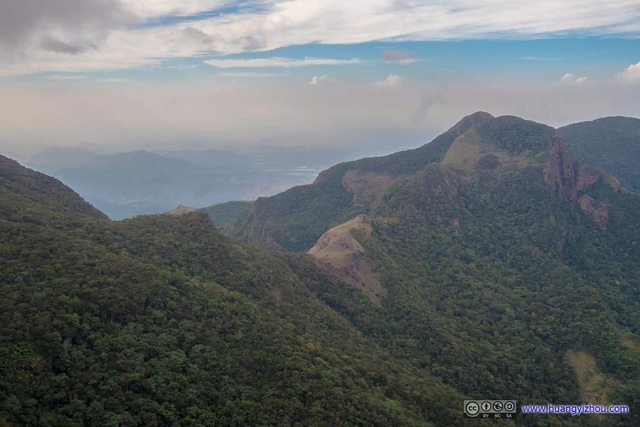 After that, it’s a 50-minute ride starting in total darkness and light drizzles along the winding country roads of Sri Lanka to the ticket station of Horton Plains. 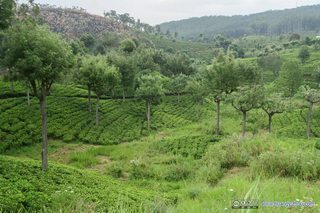 On the way there we passed farms and orchards that I believed looked just like any typical British countryside, which was nice. And from time to time, we found ourselves in fast-moving mists over the plains that looked fabulous against twillight. 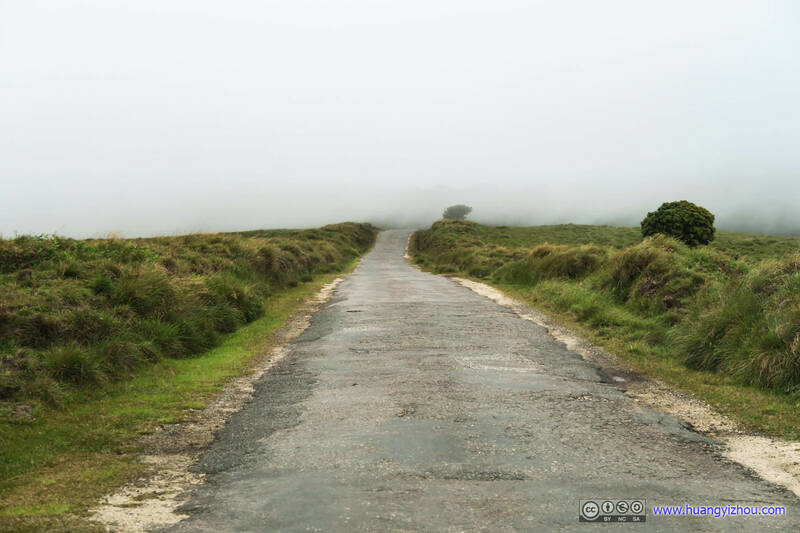 So to sum up the ride, it’s Silent Hill minus zombies and dreadful BGM. 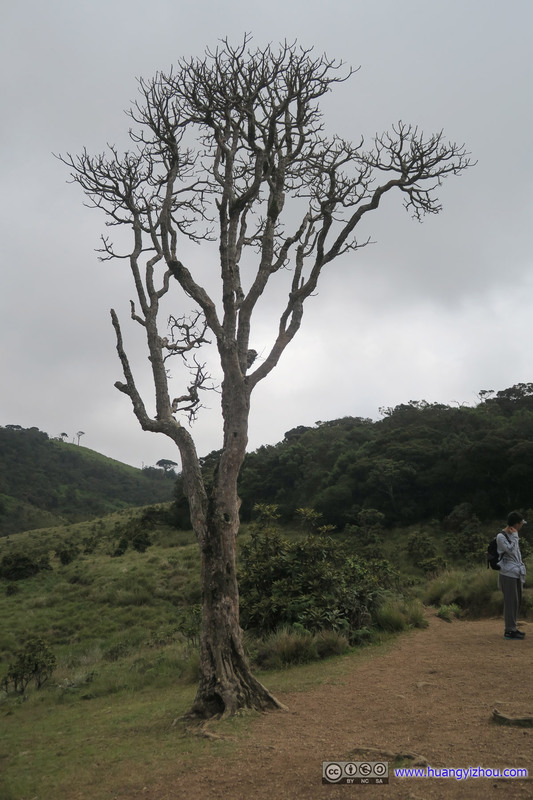 Oh, we could have watched the sunrise on the way to Horton Plains. It’s just that luck wasn’t on our side, and we were driving in woods when the sun actually rose. Unfortunately, chaos replaced scenery as we arrived at the ticket station of Horton Plains. 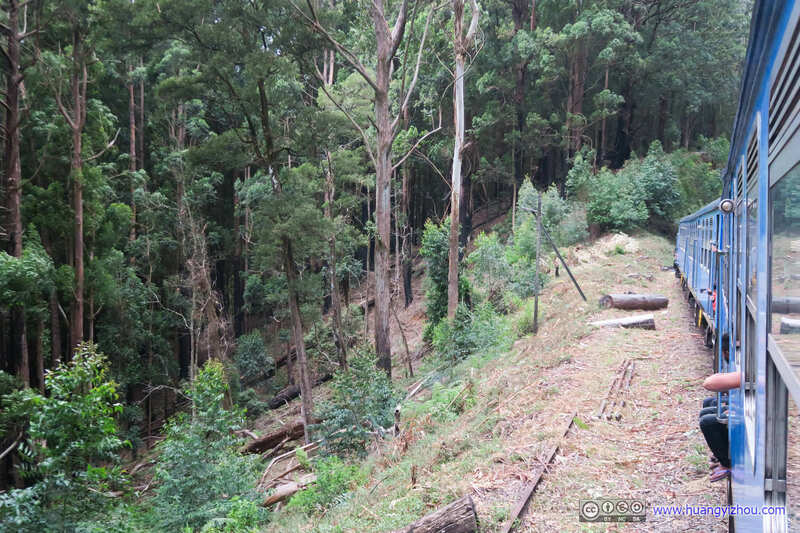 Well, somehow everybody needs to purchase tickets at this ticket station 5km away from the start of trails. And instead of building a proper toll gate like the ones on the highway, Sri Lankans thought a hut on the side of the road should suffice as a ticket station but it didn’t. 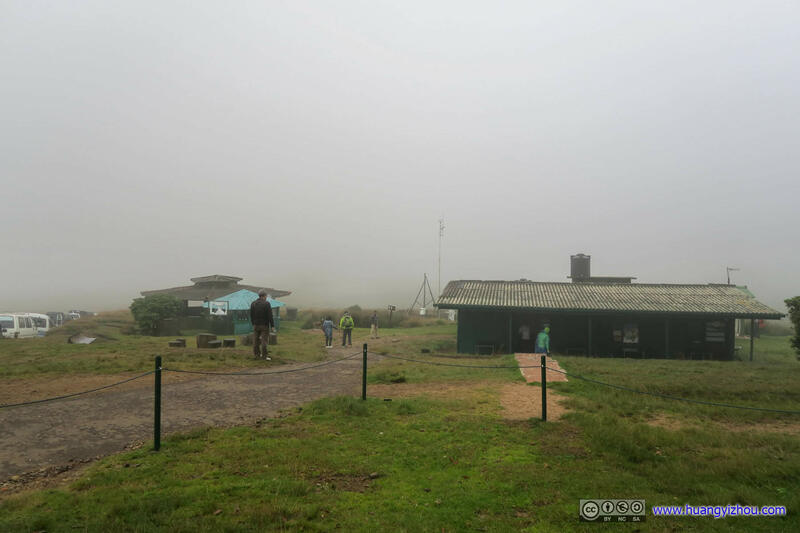 To begin with, this means one person from every visiting car must get off, find his way among dense fog to the ticket house, and in freezing wind stand there for 20 or so minutes before he can get his ticket. 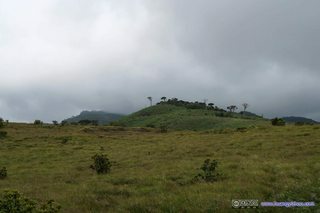 And since I was the only person awake in the car, that person was me. And, since Sri Lankans didn’t bother to build a proper parking lot at the spot, it’s a game of Klotski among stranded cars (whose drivers were waiting in line) to the actual entrance of the Park. 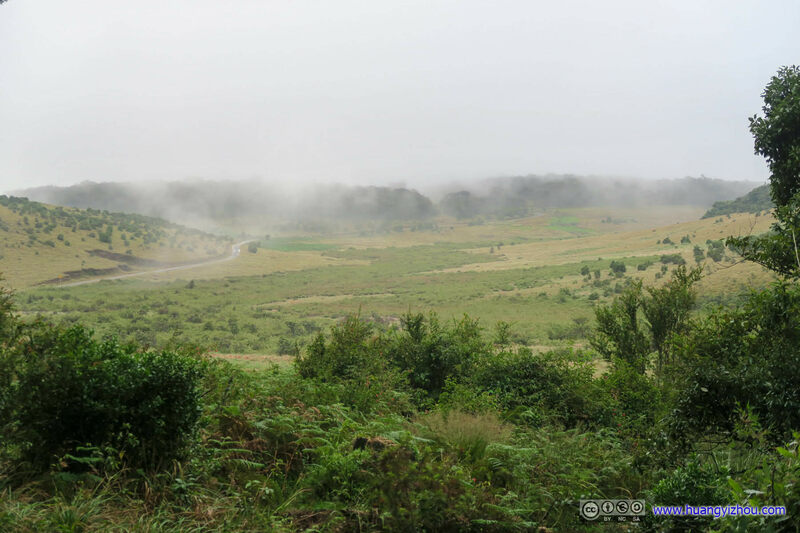 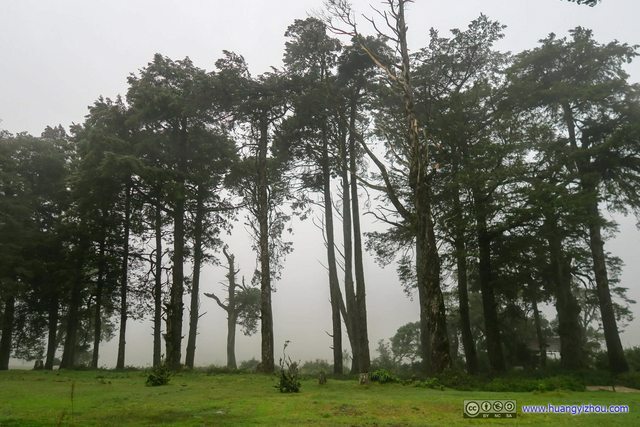 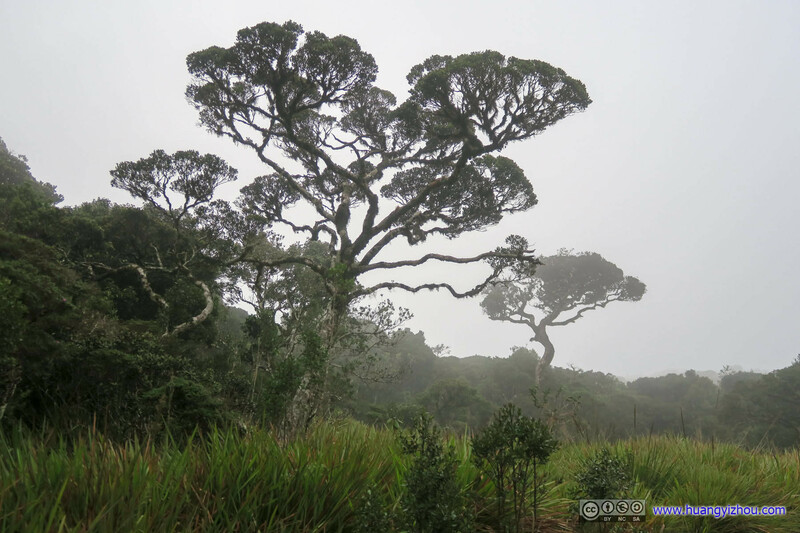 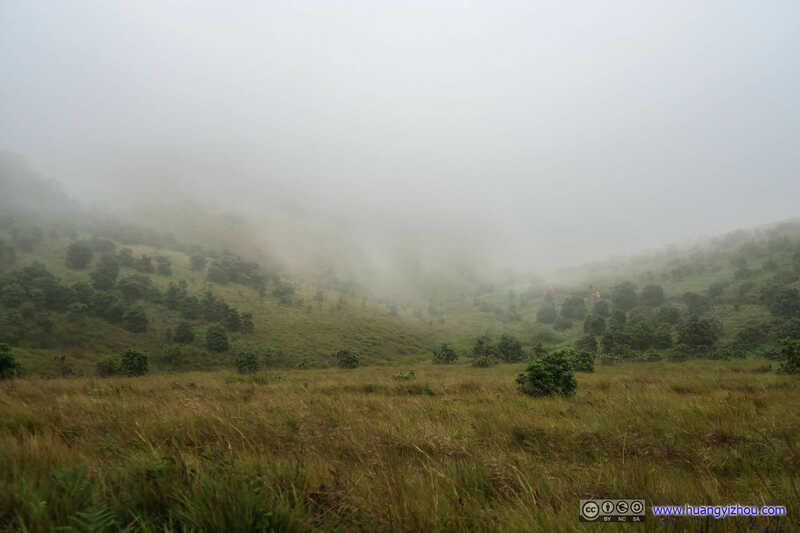 So finally at 7am, we started our hike of Horton Plains, among shifting mists. 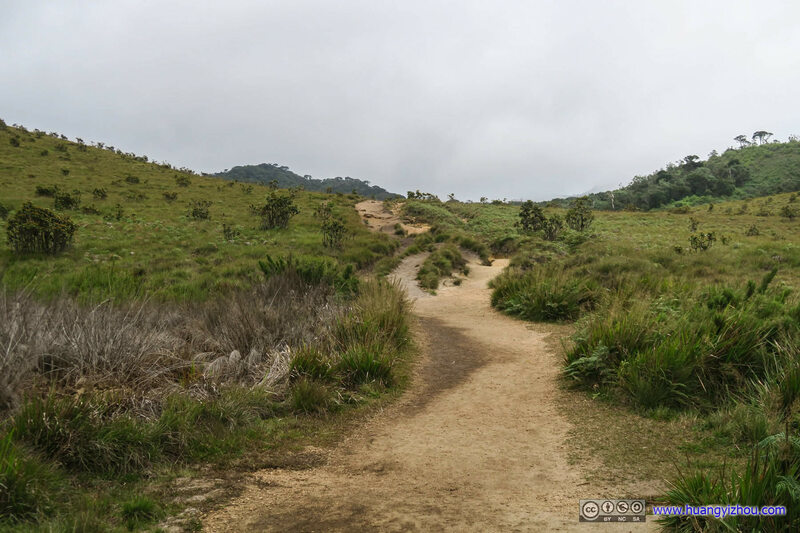 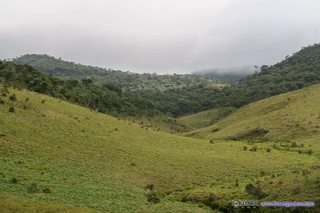 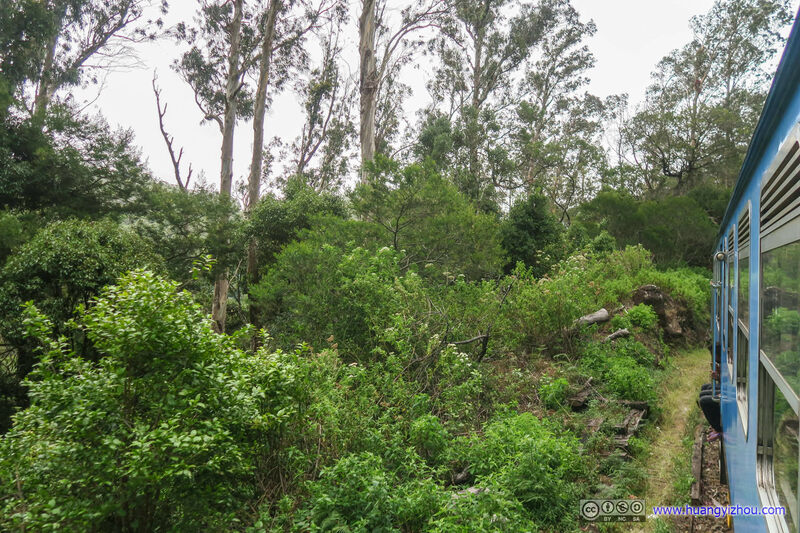 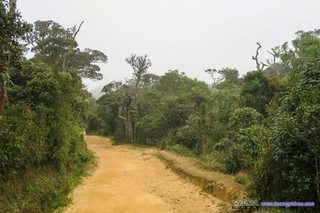 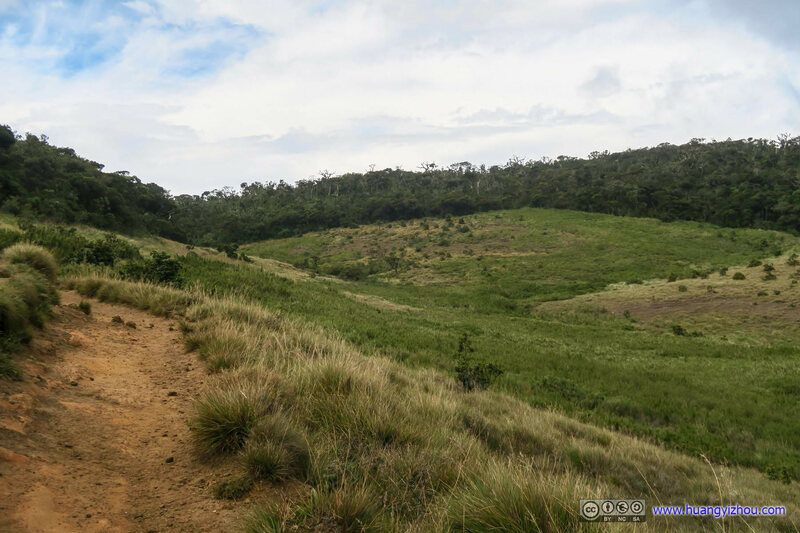 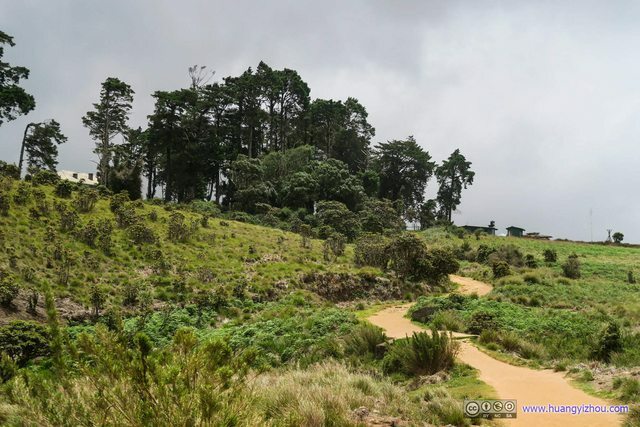 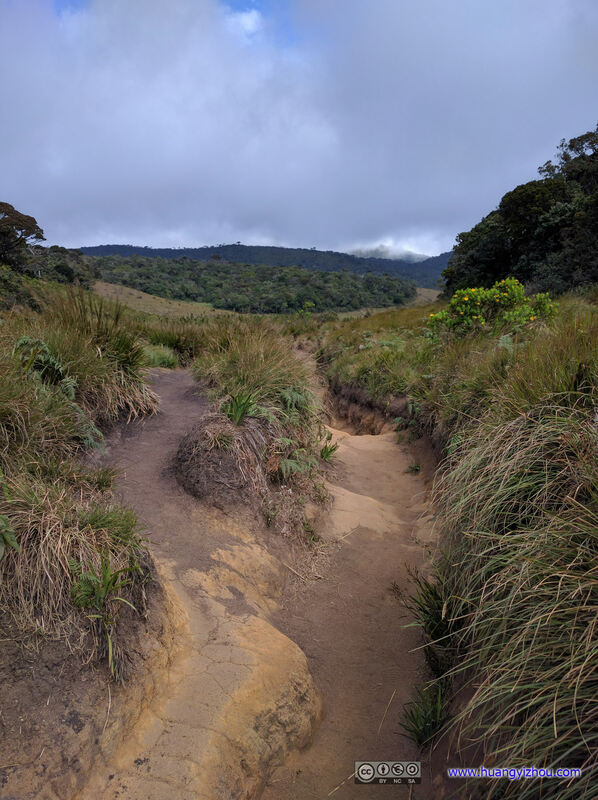 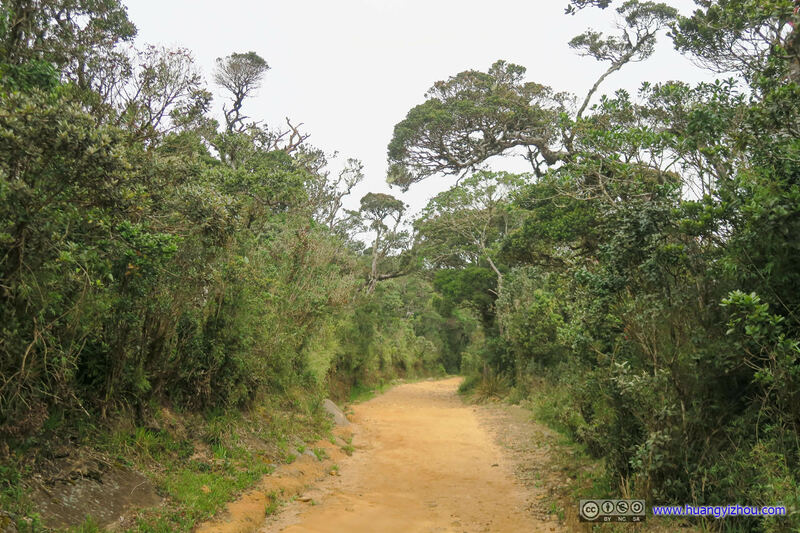 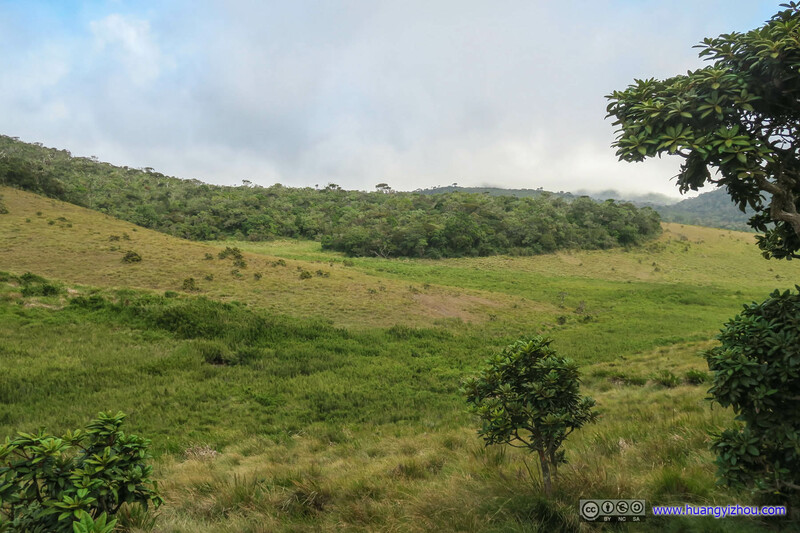 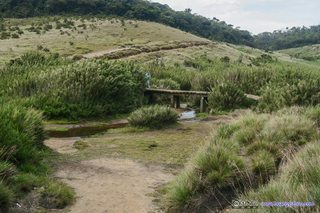 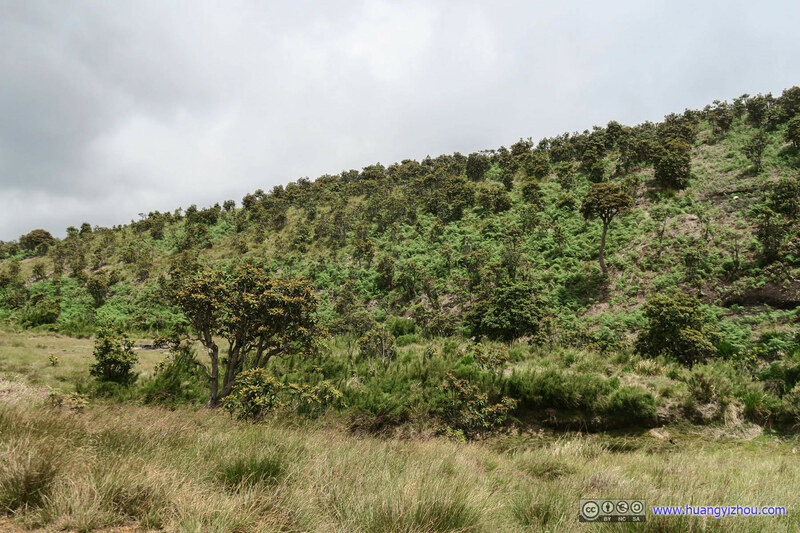 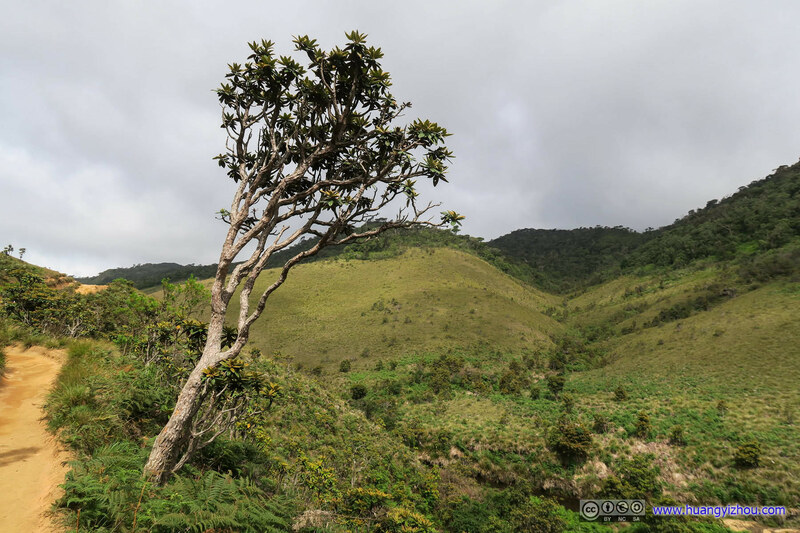 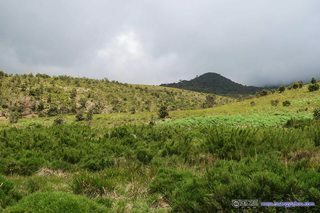 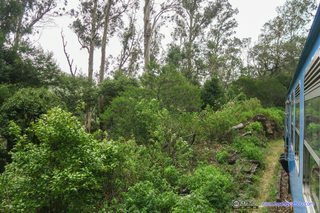 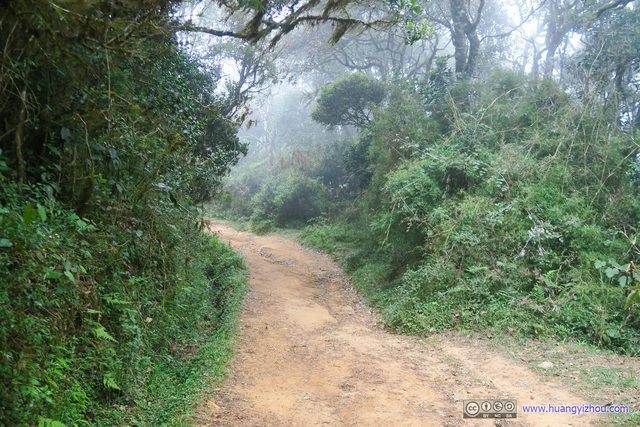 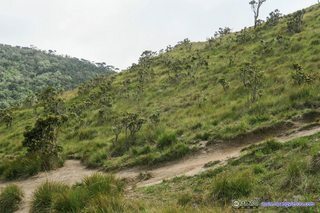 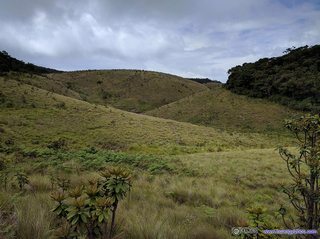 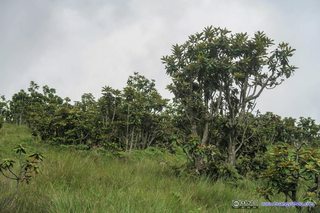 The trail at Horton Plains is circular. We chose left at the only intersection, which should lead us to World’s End faster. 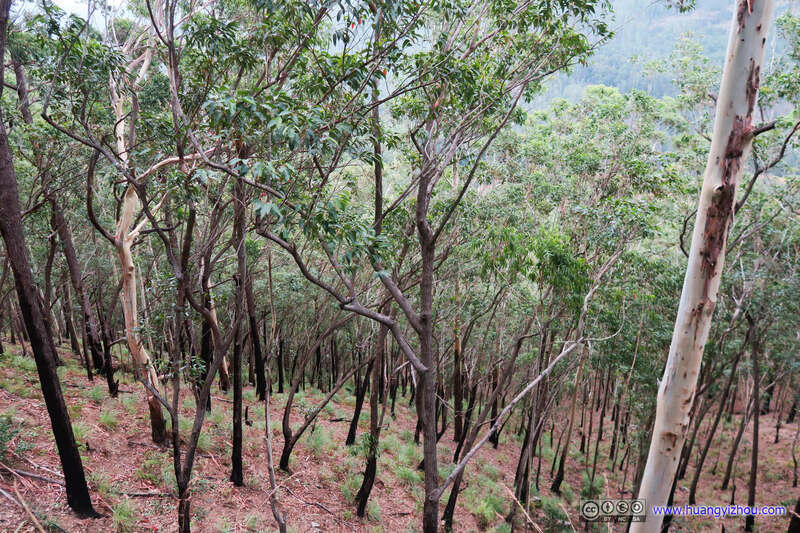 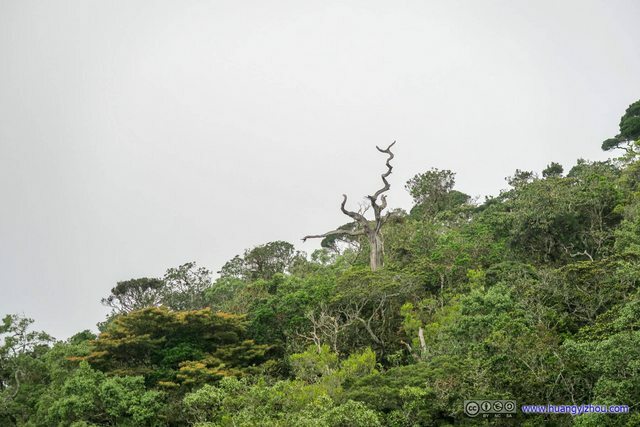 It looks like tropical trees never grew up straight. 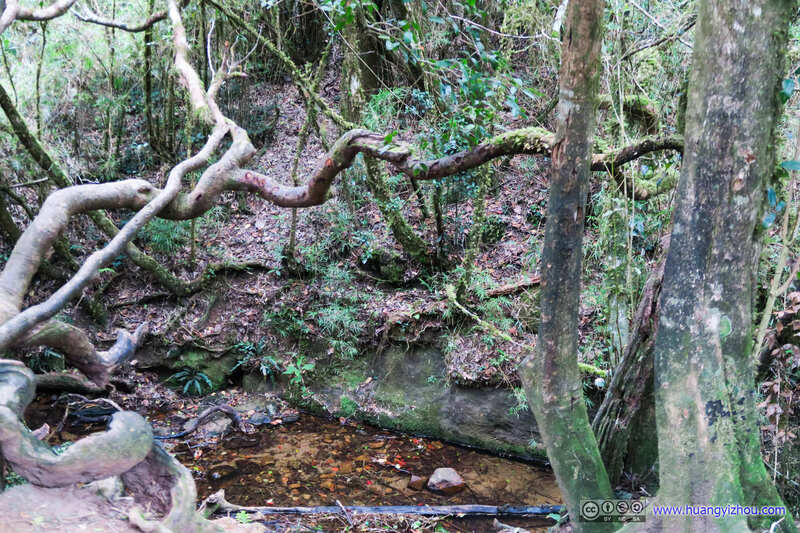 And a sole, rather twisted tree out of it. 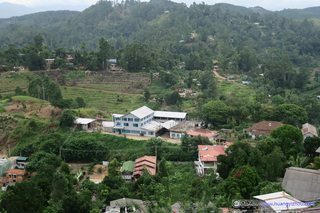 So at about 8 in the morning, we arrived at Mini World’s End, which is (a mini version of) a cliff overlooking the villages below. Well, it wasn’t as steep a cliff as I had in mind, the one-more-step-and-you-fall-down-1000-meter type. 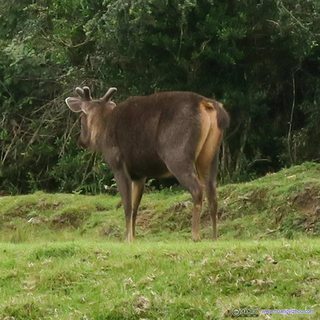 Although all but one of my friends very much seemed to be enjoying it. 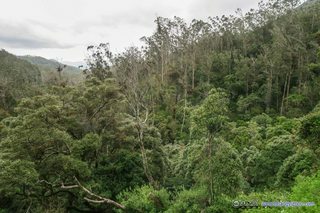 And I liked the vividness of colors of trees below this Mini World’s End, which was not the case for the proper World’s End. After that, we explored a nearby hardly-travelled detour before heading to the actual World’s End, while watching clouds fly by over the plains. 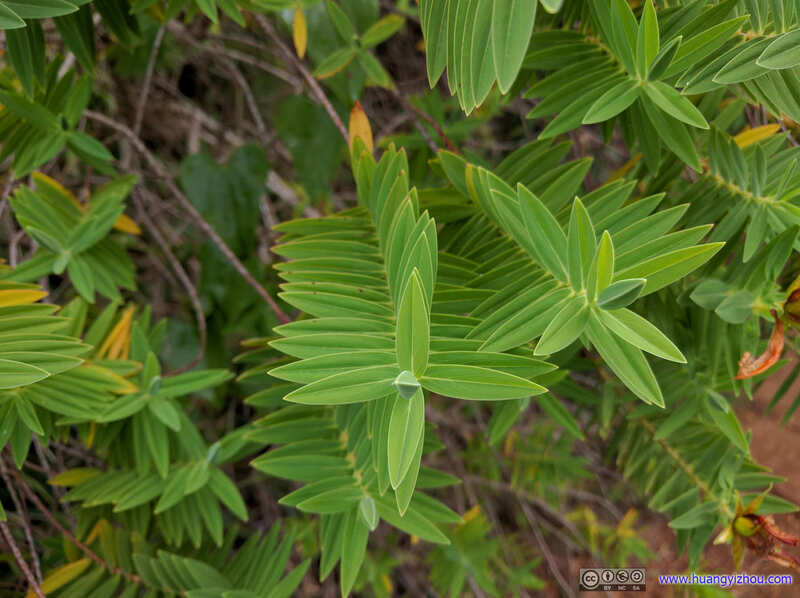 This one could join some “binary tree” contast. 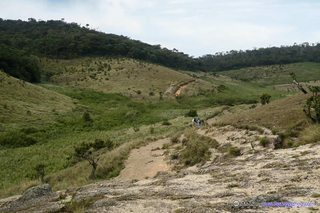 After that, we went back to Mini World’s End and picked up our acrophobic friend, and went on the proper trail to World’s End. At a quarter past 9 we were at World’s End. 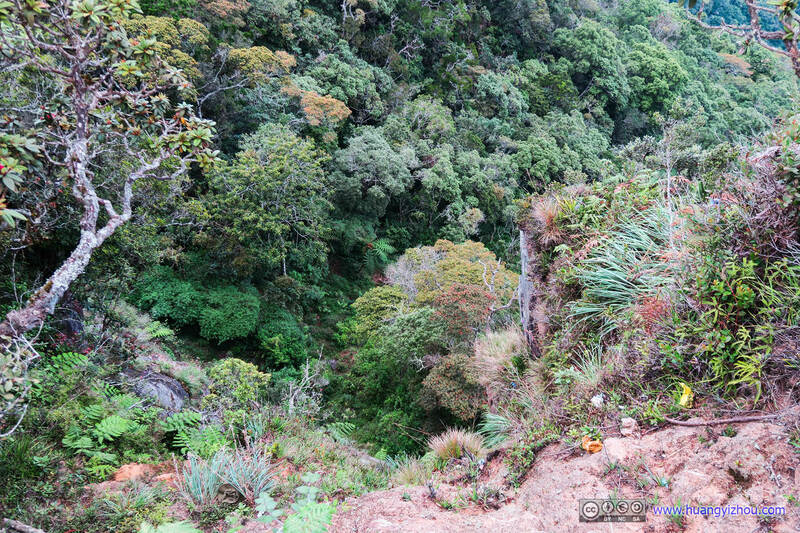 Again, perhaps because it’s not that much a steep cliff as I had anticipated, I wasn’t that much excited. 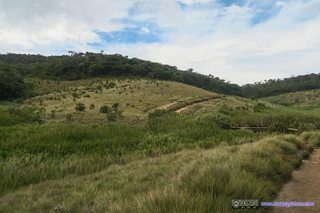 I went around trying different angles to take a photo that looked like I was sitting on an edge of a high cliff, but I couldn’t find a satisfying shoot. 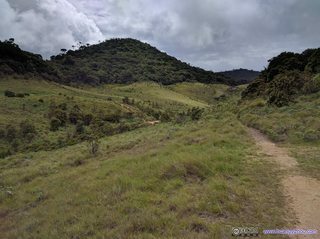 By comparison, I think it’s better at the previous detour, where one can actually see the cliff. 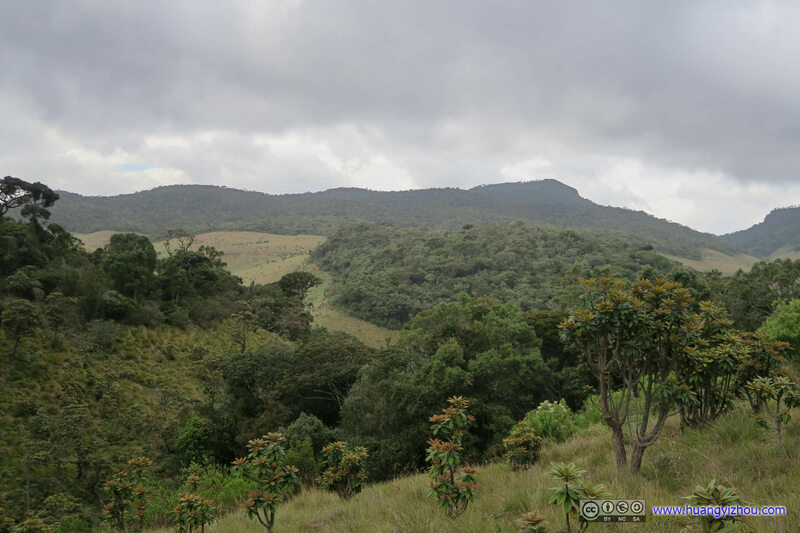 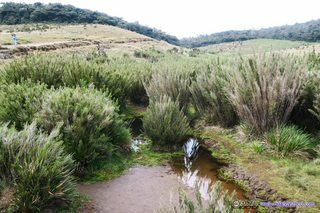 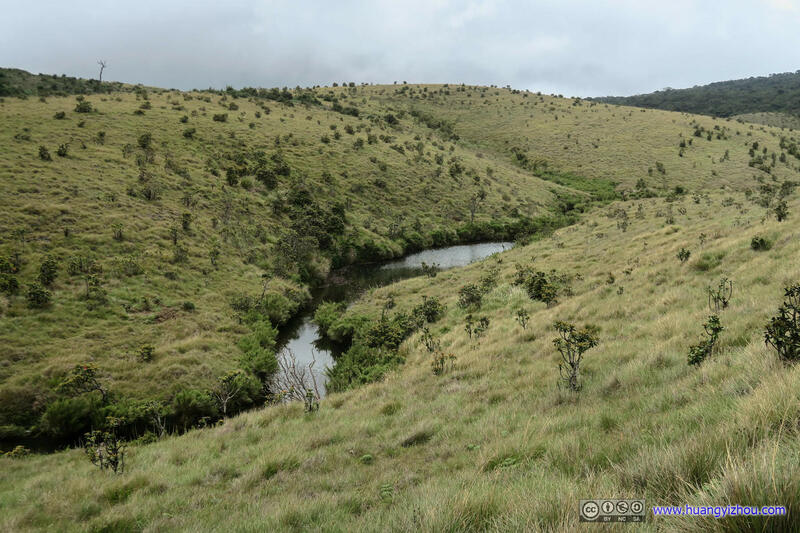 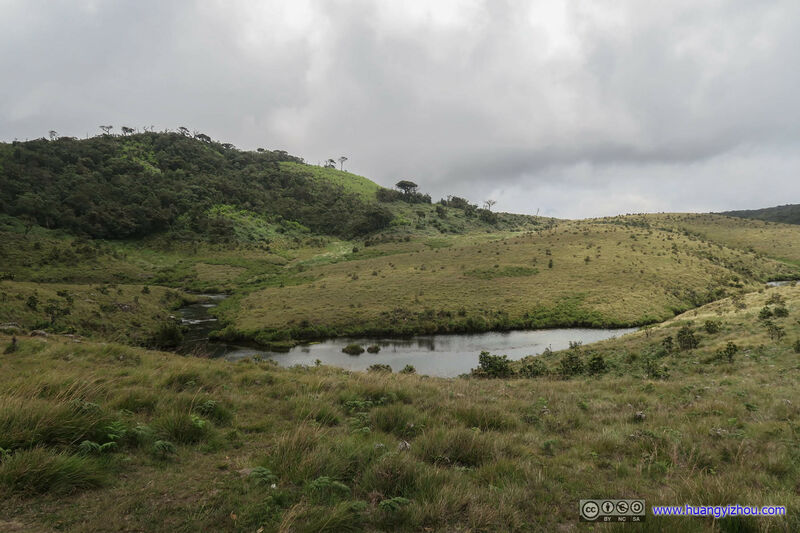 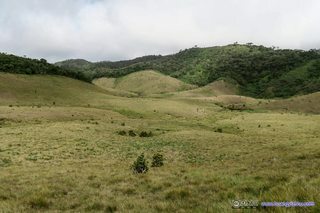 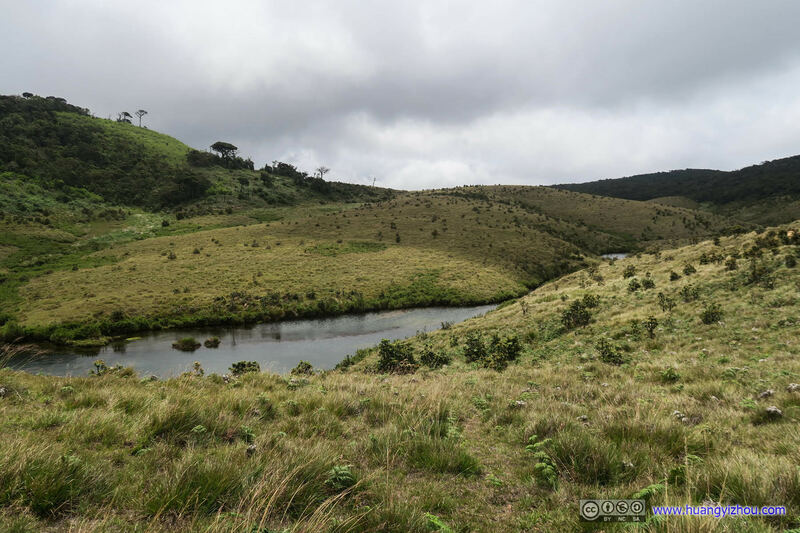 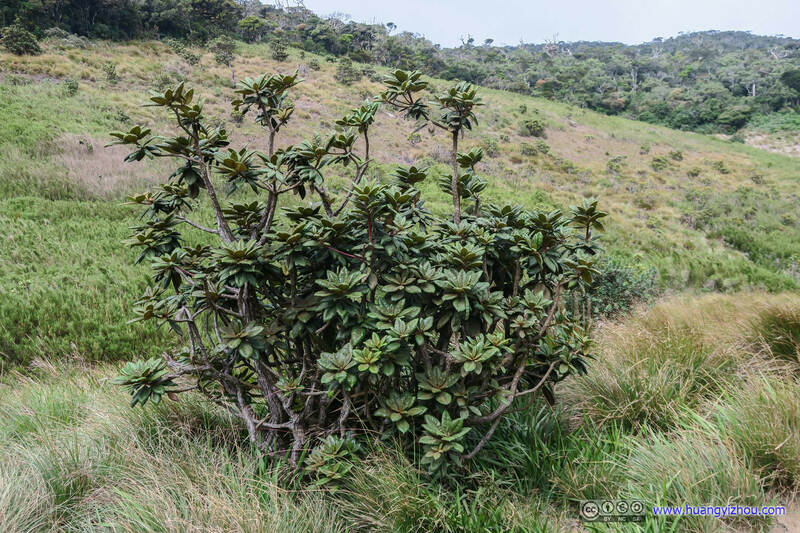 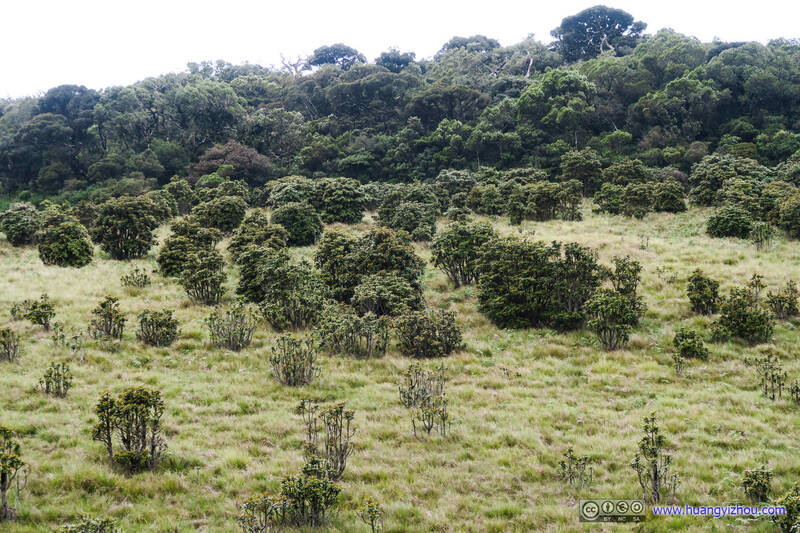 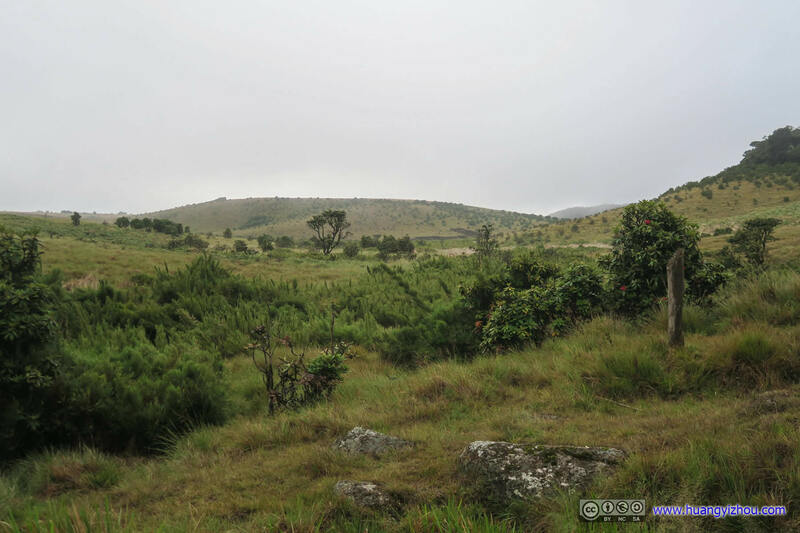 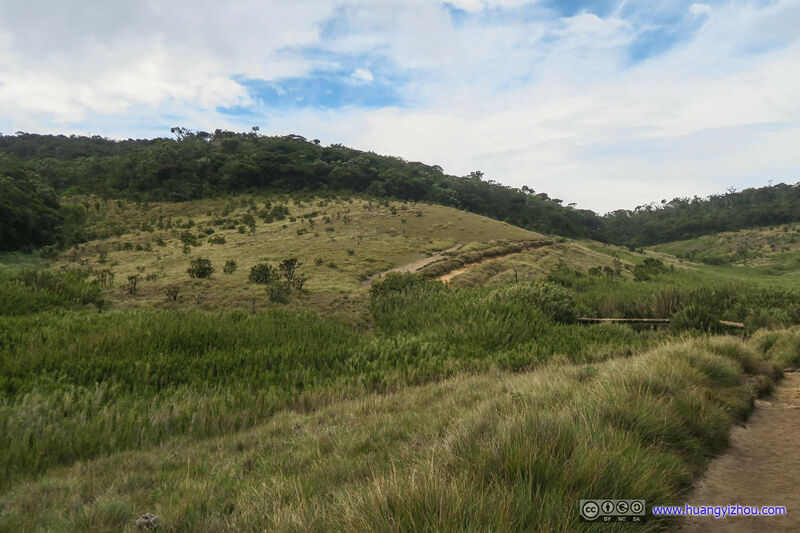 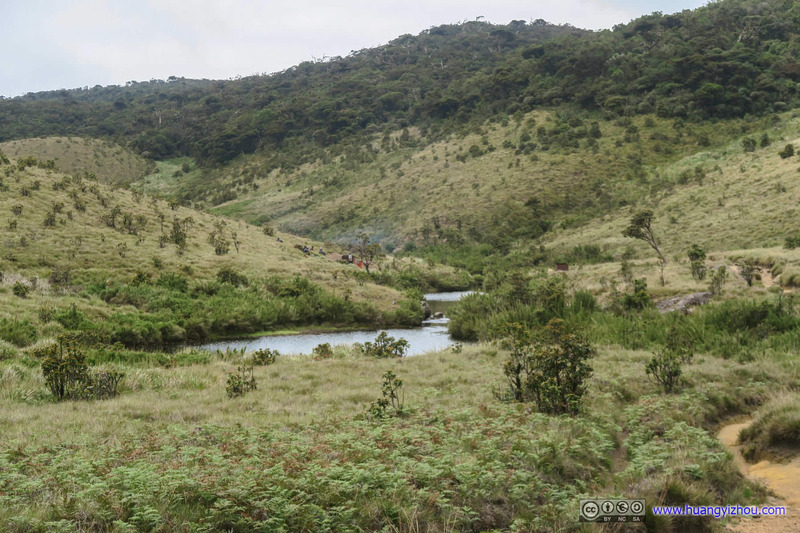 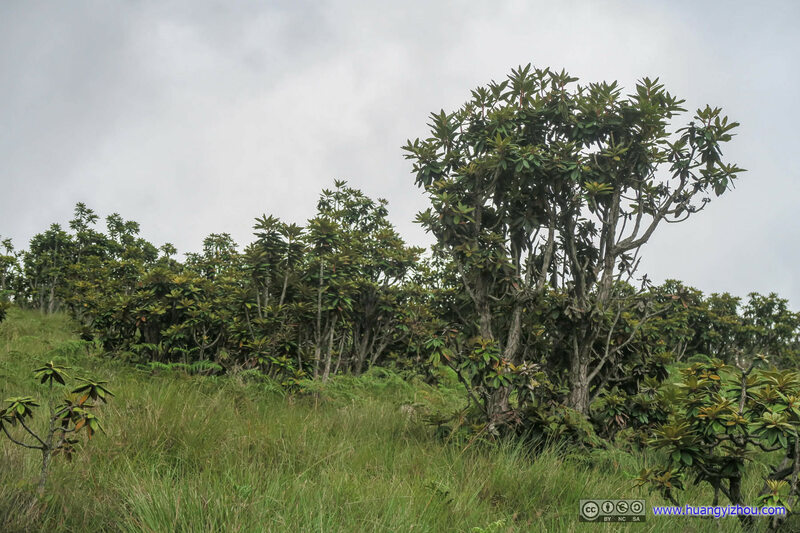 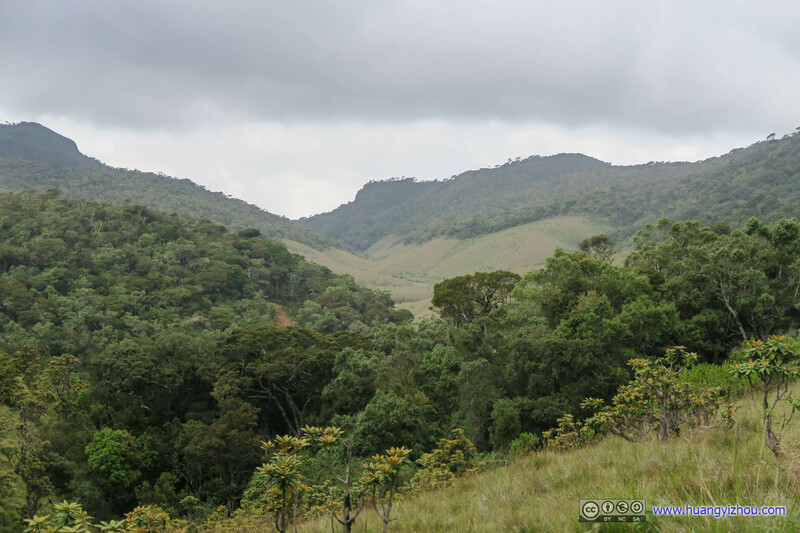 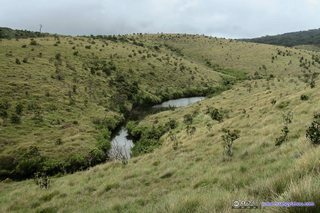 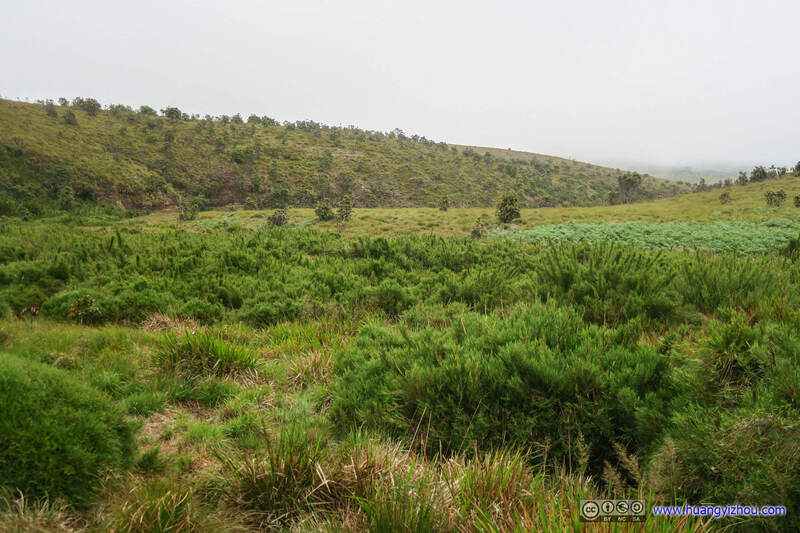 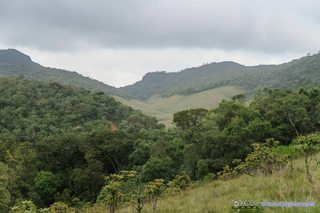 After that, we trekked on the “plains” part of Horton Plains back. 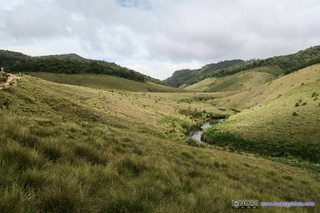 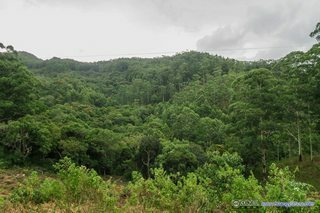 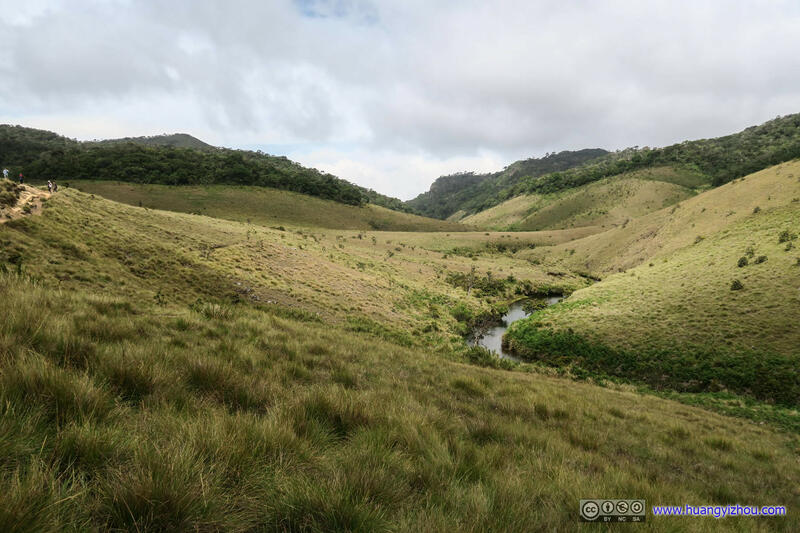 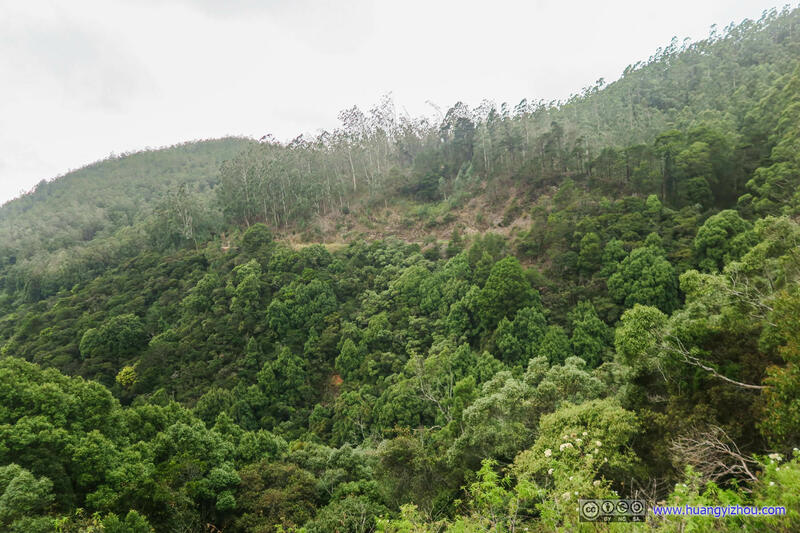 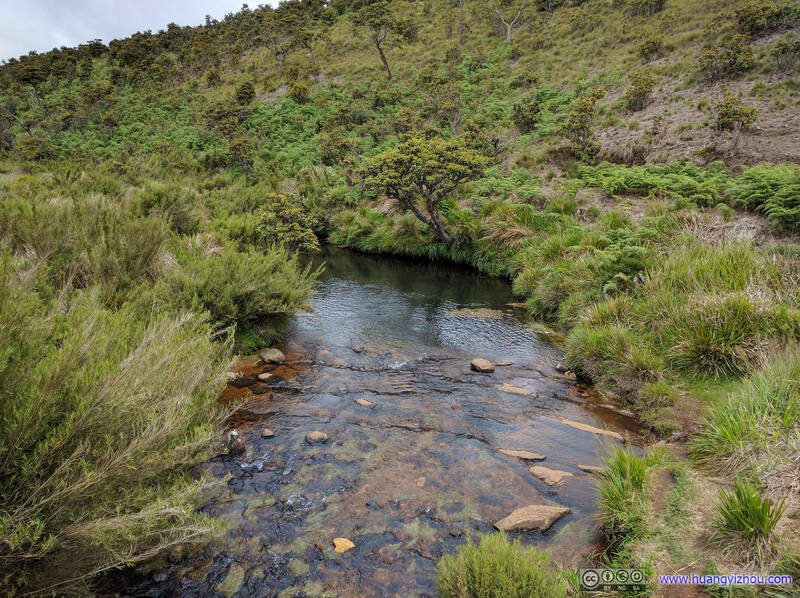 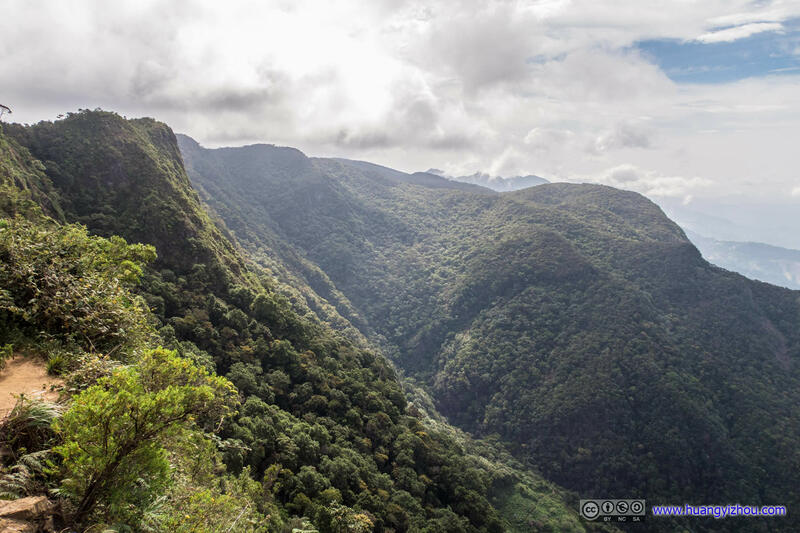 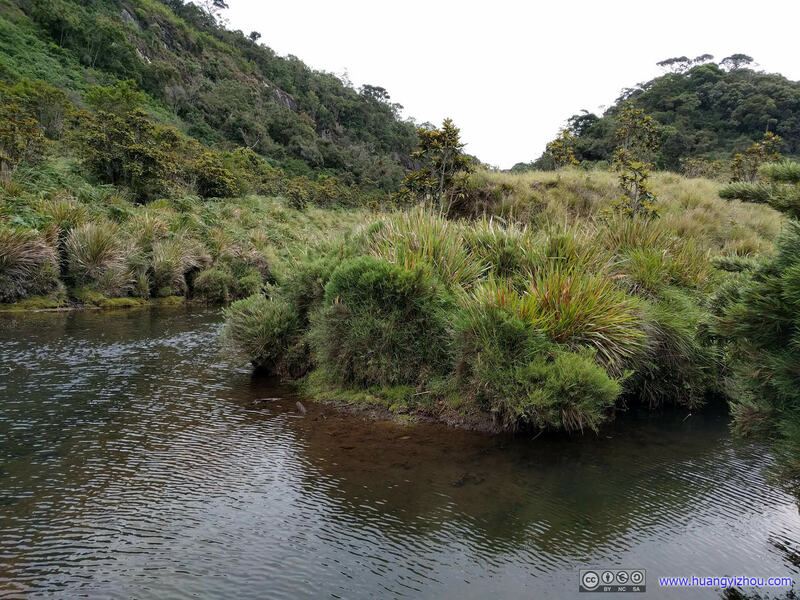 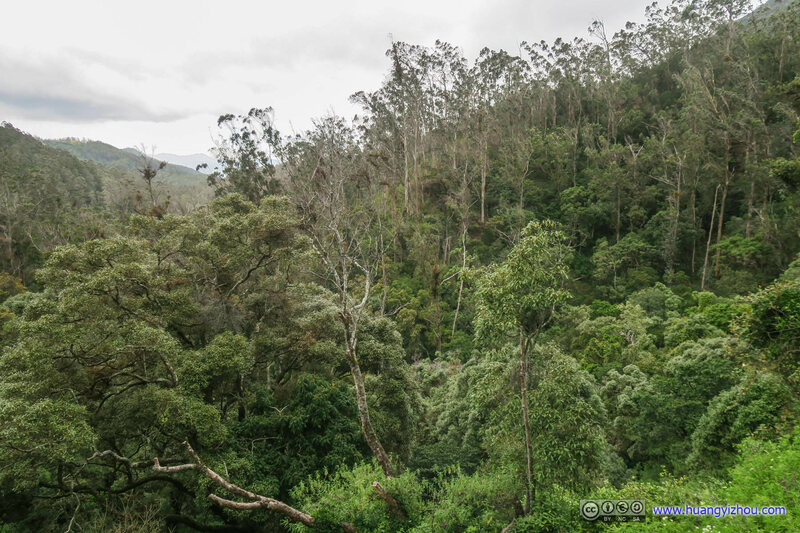 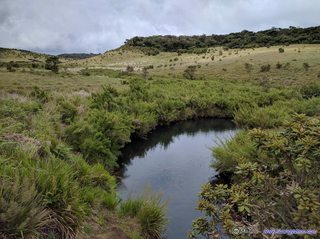 There’s a creek running through Horton Plains all the way to the distant Samanalawewa Reservoir. 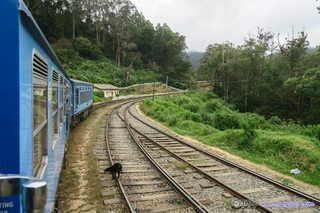 For the later part of our hike the rail run parallel to the creek, and at one point, one could get close to the waters. Three of my friends picked three different routes. 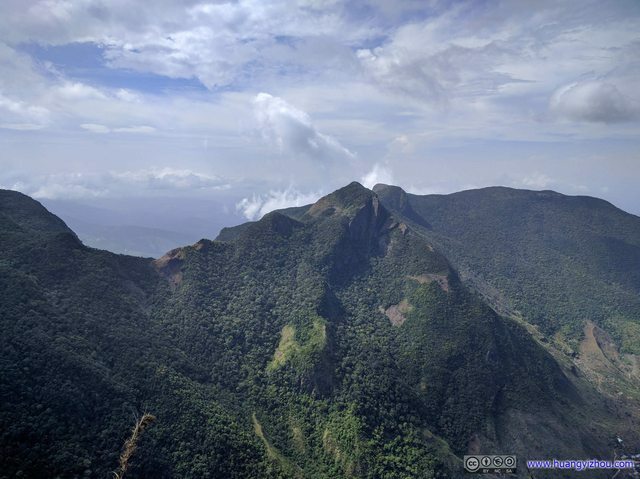 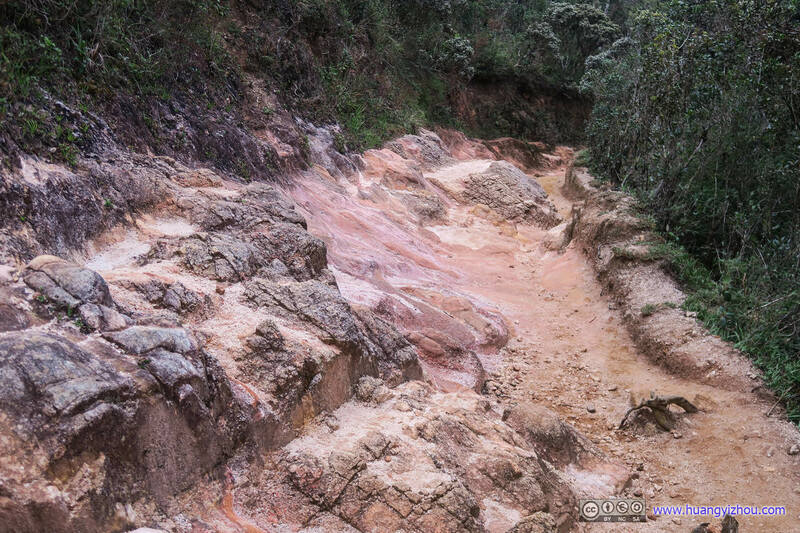 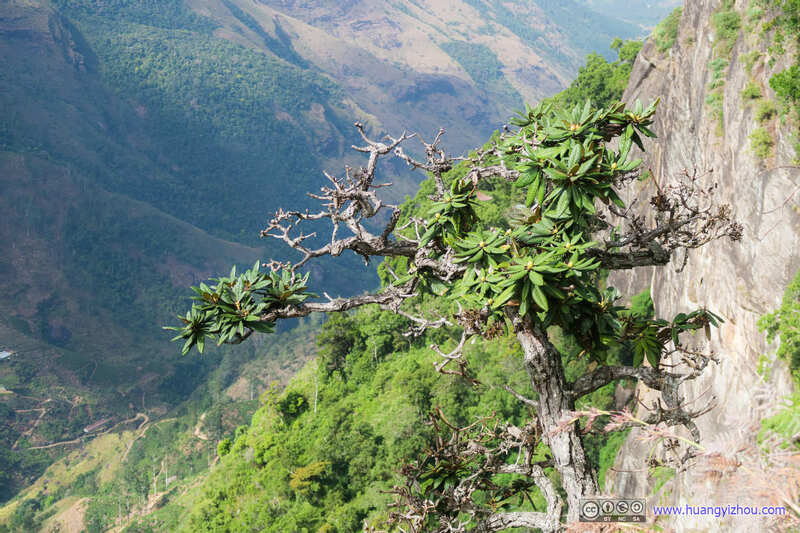 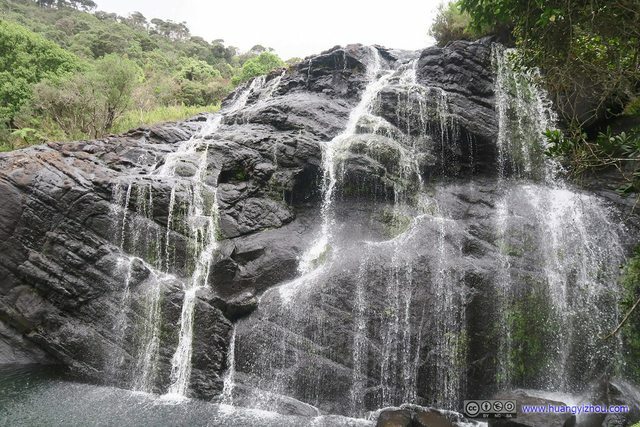 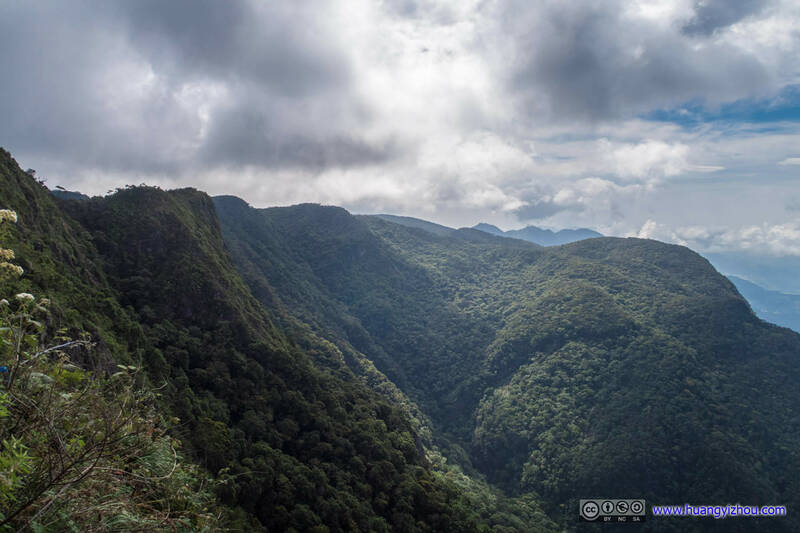 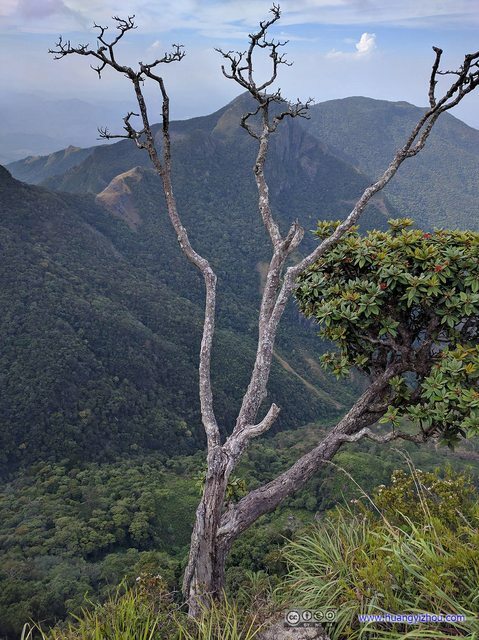 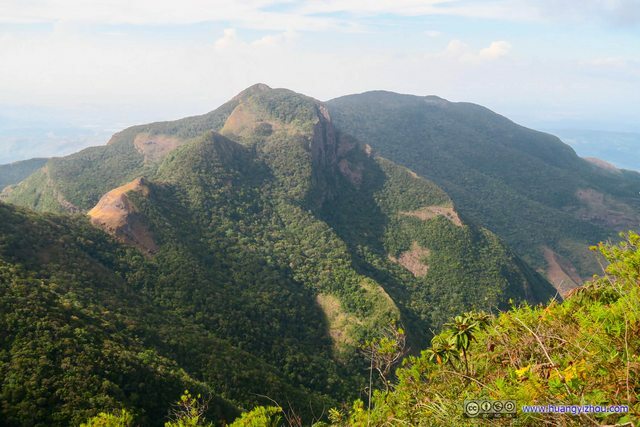 One of the few notable scenic spots in Horton Plains (besides World’s Ends) is this Baker’s Fall, the visit to which consist of climbing down 50 meters to the fall itself, and climbing back up (which is not the fun part). Compared with the cliffs of World’s Ends, this Baker’s Fall is just a small waterfall on the aforementioned creek, not remotely as exciting, so we didn’t stay here for long. 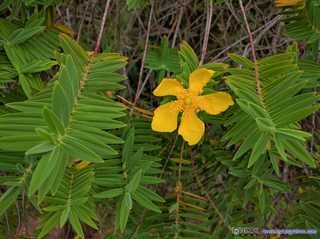 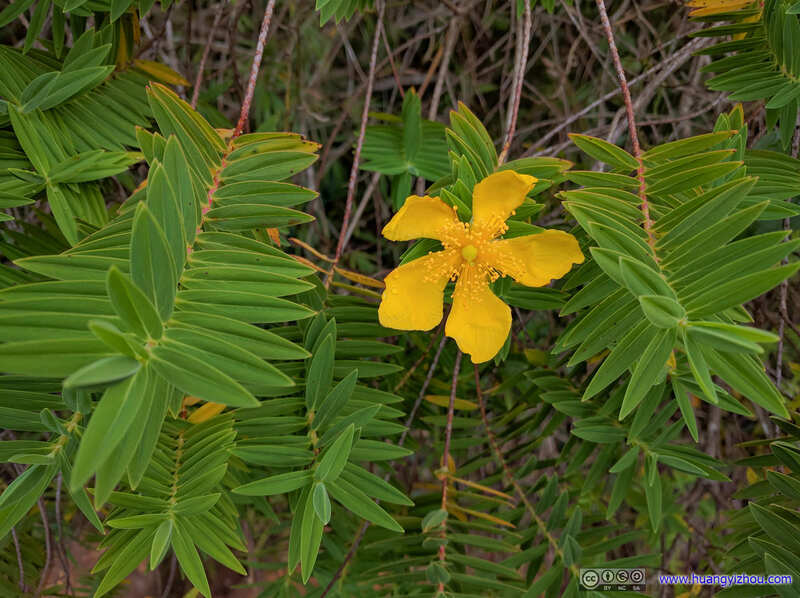 One more “binary tree” contestant. 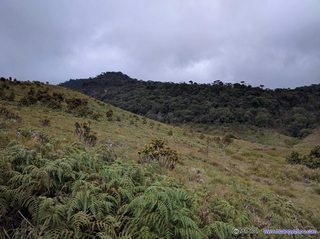 Just a sense of how windy the plain is. 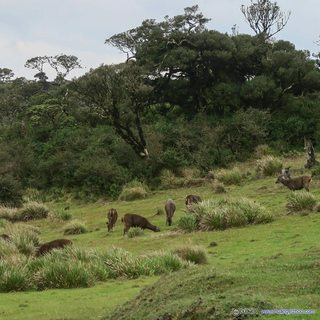 It’s said that many deer inhabit the land of Horton Plains, but we didn’t find any during our hike. 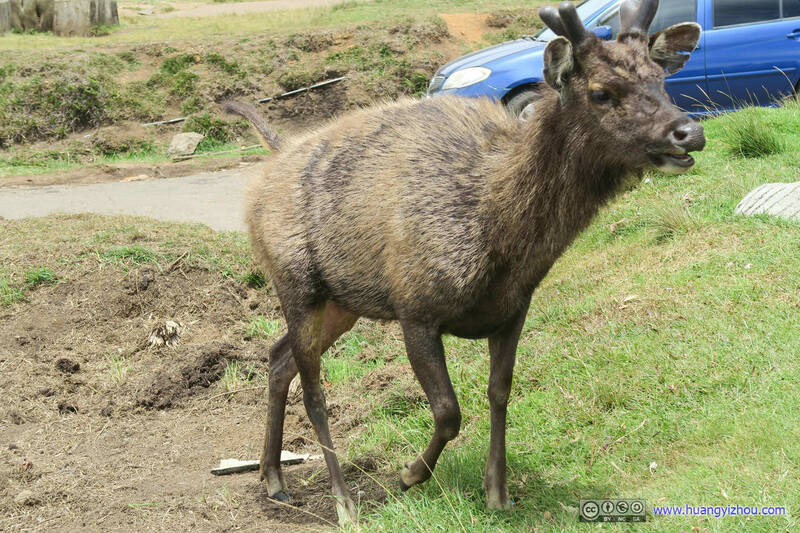 Finally, when we finished our hike and returned to the parking lot, luck was on our side, as this creature was roaming the parking lot seemingly unafraid of the pack of human surrounding him. 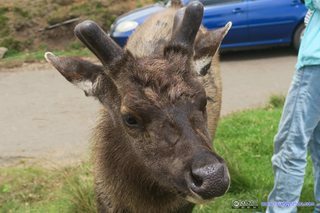 Well, I wasn’t brave enough for any physical contact, but judging by the fact that my daunting friends who patted his antlers over and over again survived intact, and he’s gladly taking in fruits offered by fellow visitors, I don’t think deer in Horton Plains were good friends to human. 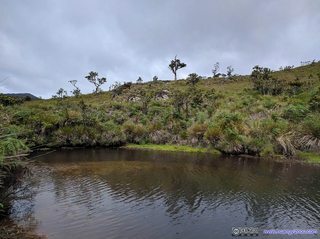 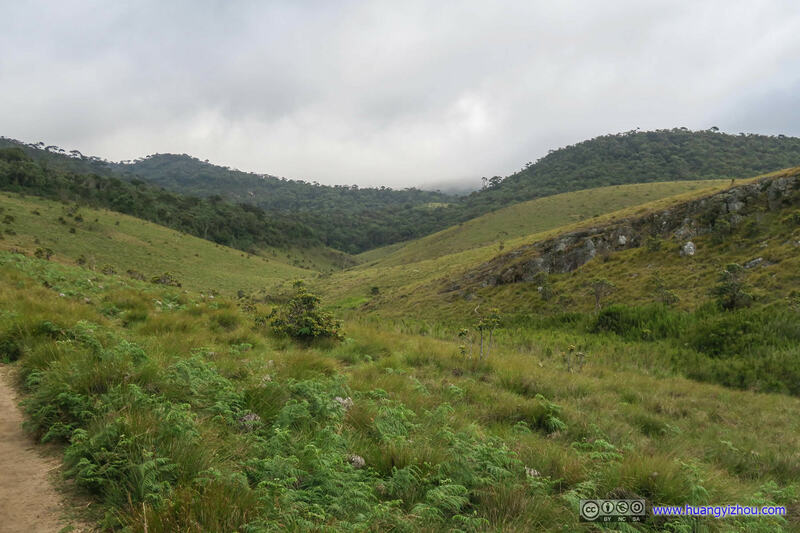 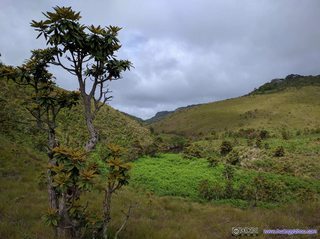 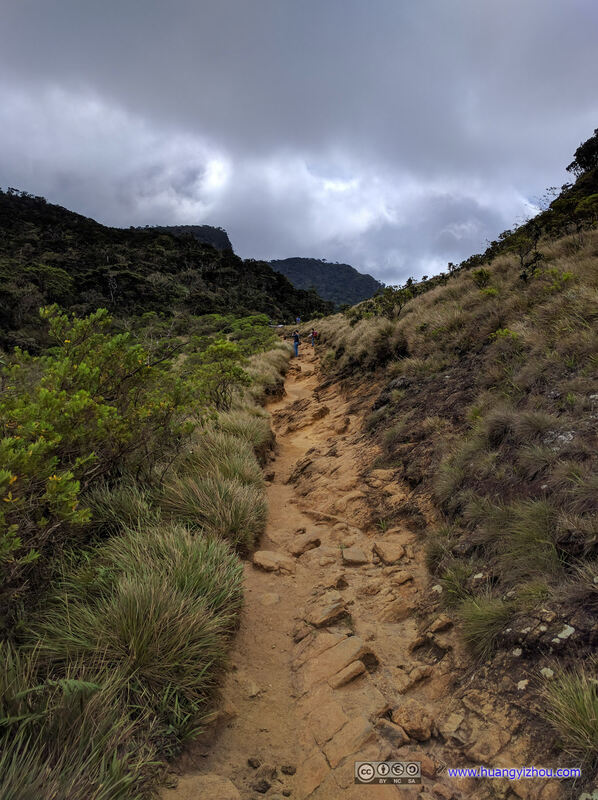 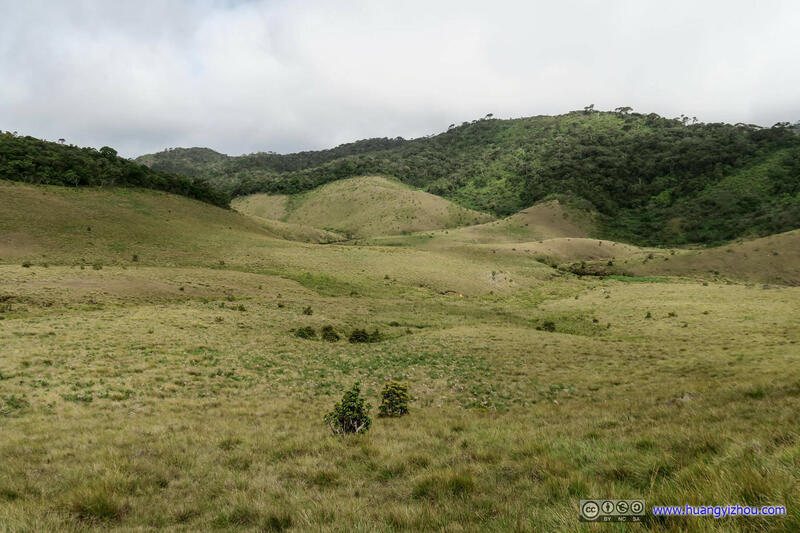 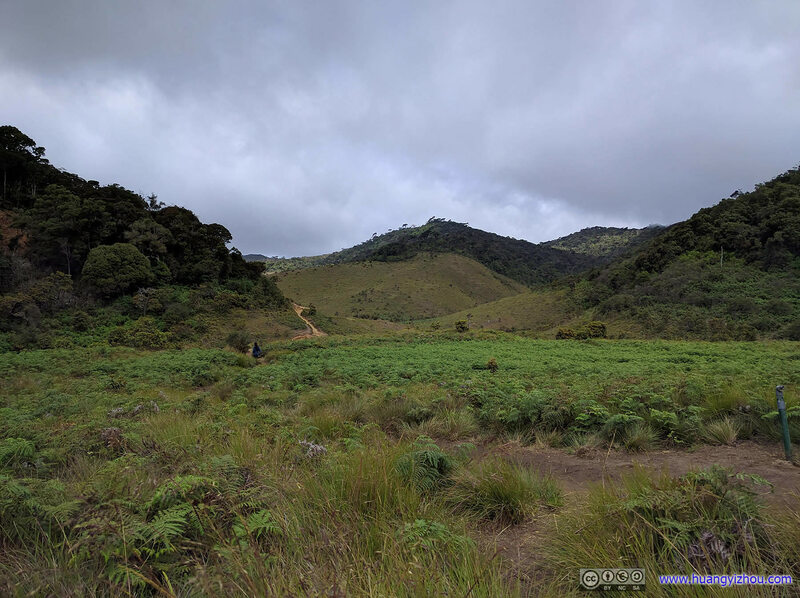 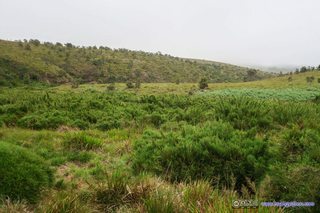 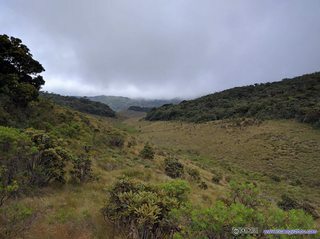 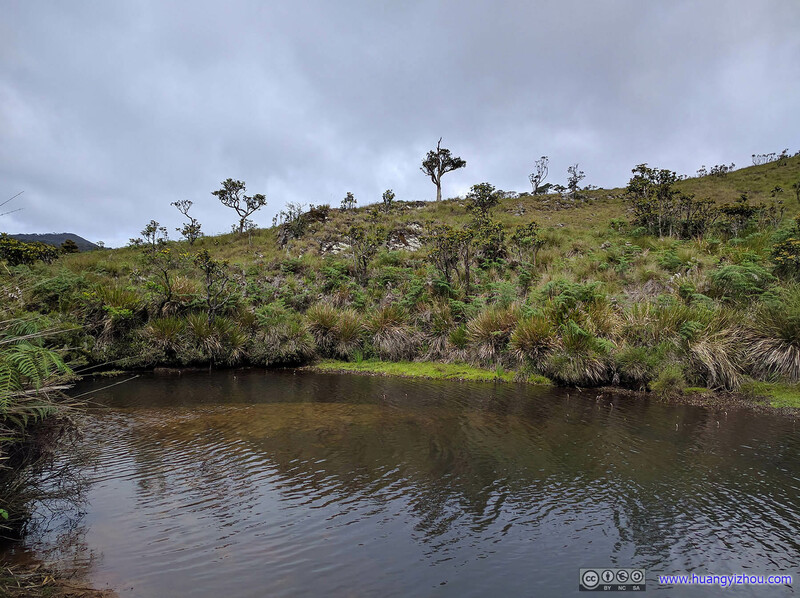 Well, I sort of considered myself as an our-doory person, so I came to my surprise that Horton Plains was the first “plain” that I hiked (probably because I mostly do mountains). 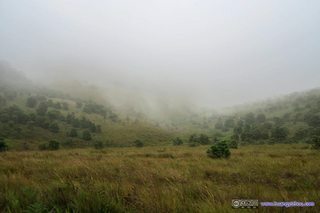 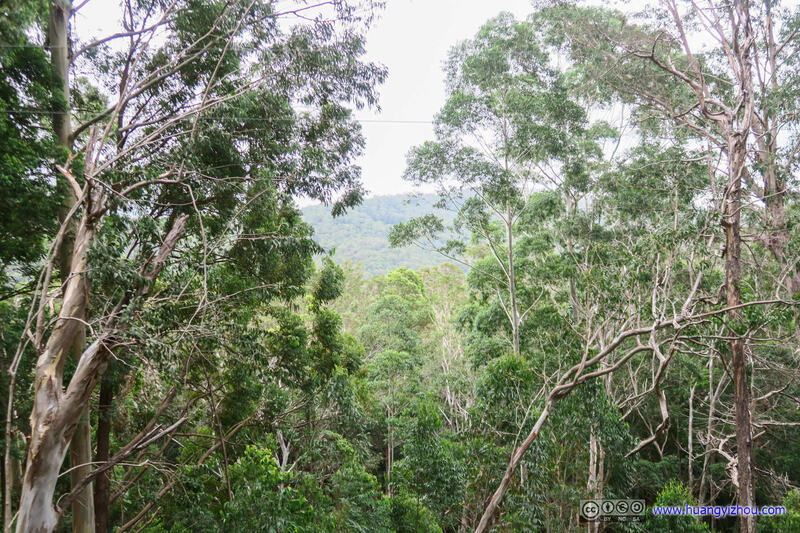 I did enjoy watching the revolving scenery of meadows and forests along the hiking trail that’s topped with occasional mist and threaded with a winding creek. 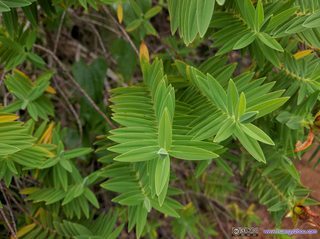 I did enjoy the variance of plants that kept the landscape evolving, and it looked like such a landscape would be all year around. 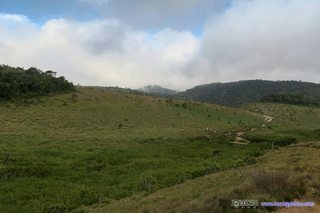 So although I don’t have other experiences of hiking plains as comparison, I would recommend Horton Plains nonetheless. However, there were downsides. If having only two bathrooms (three if you count the one at the entrance) throughout the entire 5-hour trail was a necessary inconvenience to keep the trail as natural as possible, the management at the ticket station 5km away would definitely need some improvement, as either a proper parking lot or a toll gate would resolve the chaos that almost every morning visitor experienced. 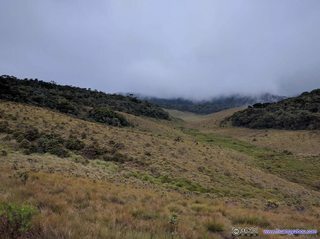 By the way, having experienced World’s End at 9am, it didn’t look to me that mists would block its views starting at 10am, thus one didn’t need to wake up in the middle of the night in order to prepare for the trip to Horton Plains (though I could never be sure). 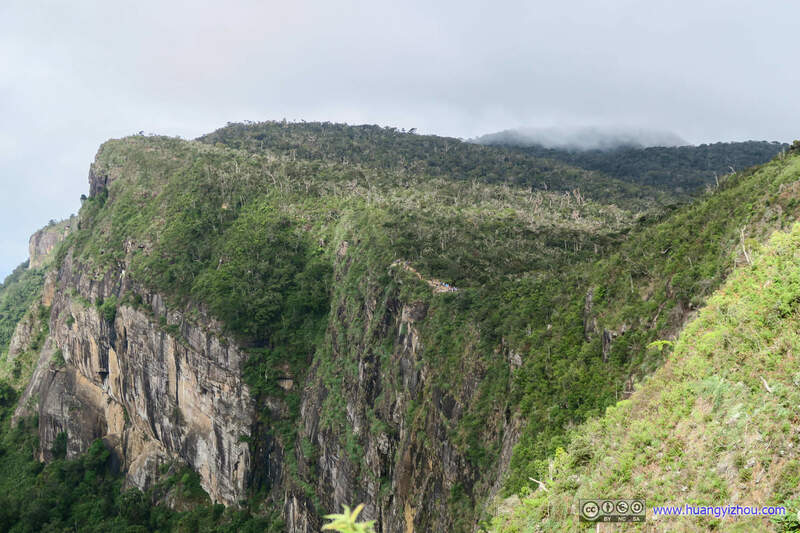 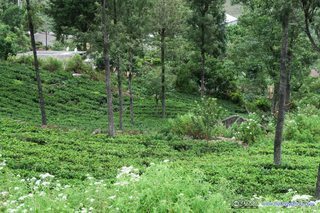 And I did see groups of Sri Lankans entering the Park later in the day as we leave, but since they were paying magnitudes less for tickets, maybe there were just for a family getaway, no bothering the views at World’s Ends. 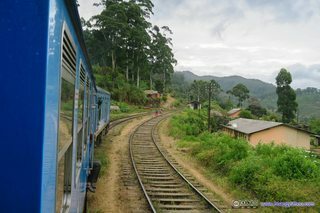 After that, our driver took us to Ambewela Railway Station, where we would board a train for Ella while our bags would travel with his van. 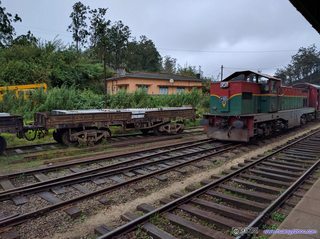 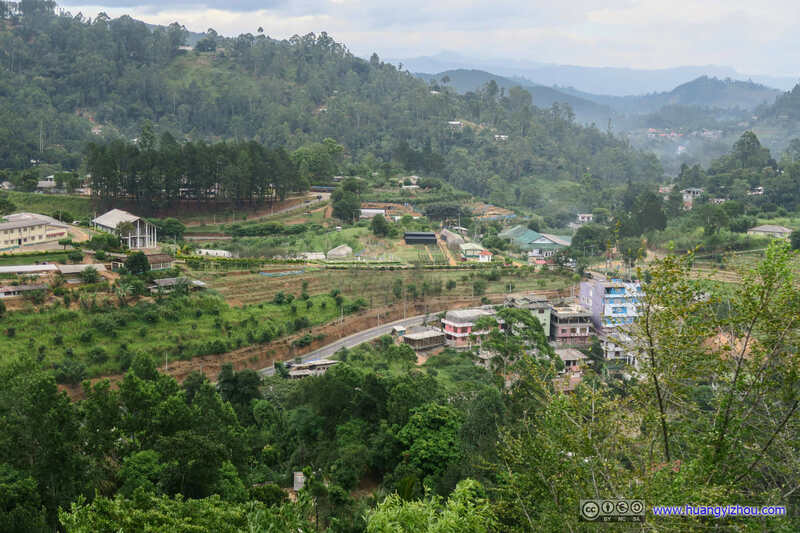 Oh, on the way there (and on our way to Horton Plains), we passed Pattipola Railway Station which has the highest elevation among all Sri Lanka railway stations. 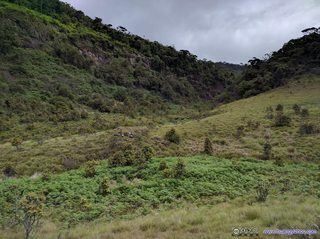 I checked timetables before we left Horton Plains, and if the train was on time, we would have minimum layover in Ambewela. 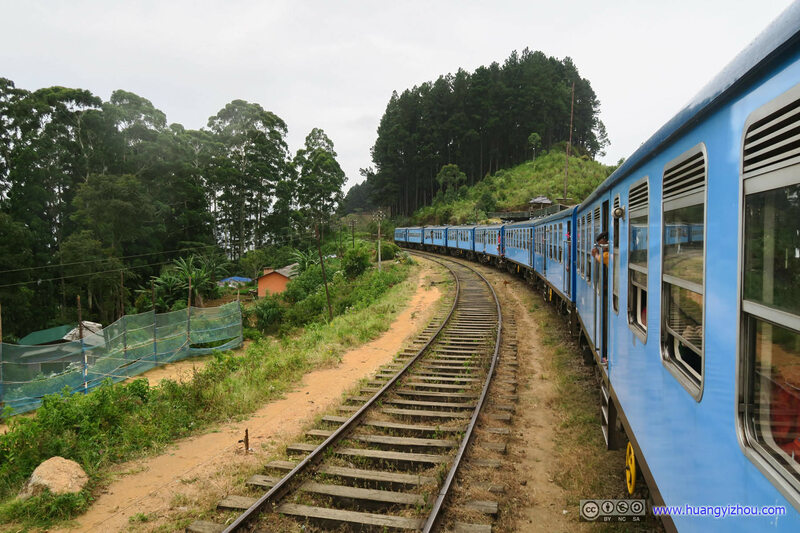 Unfortunately, this was Sri Lanka, where trains were never on time. 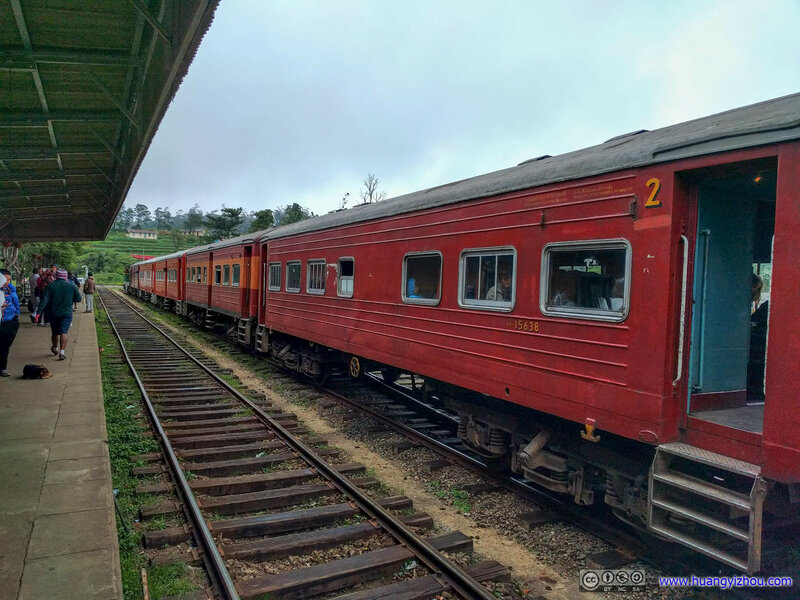 So we waited at the barely-equipped Ambewela station for more than an hour. 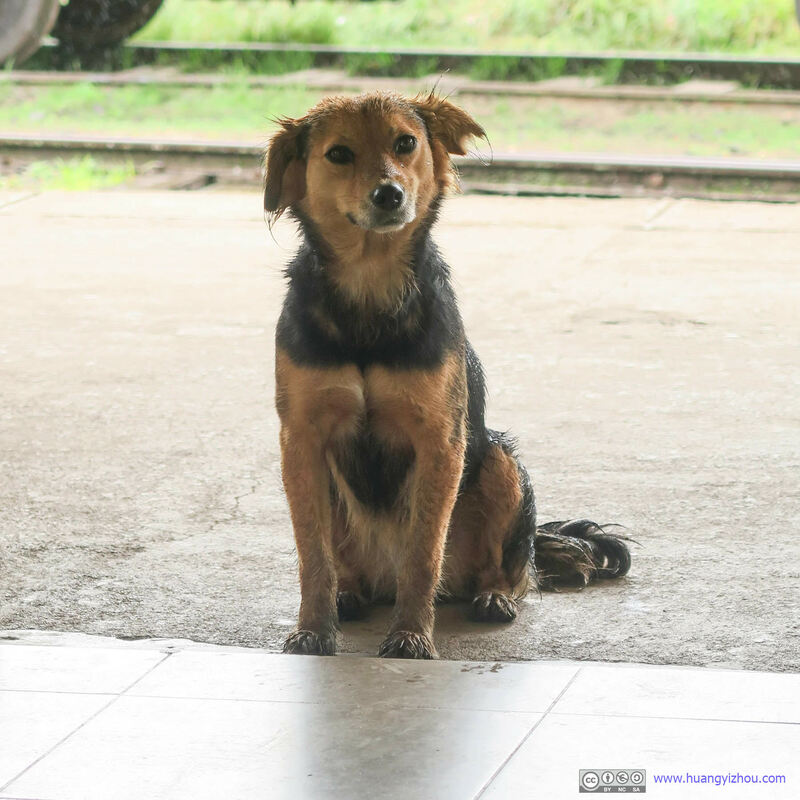 To make matters worse, Ambewela Railway Station was infested with homeless dogs, which turned out to be quite uncomfortable, to say the least, for someone with dog-phobia like me. Trust me, it’s never a pleasant experience finishing lunch in front of a pack of hungry dogs. 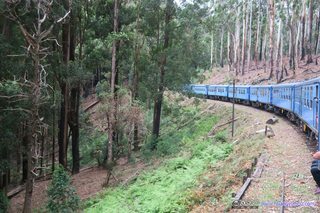 Then there’s this incident with the train ticket. 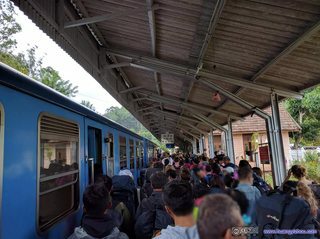 To begin with, ticket office only opened like half an hour before departure, which wasn’t so bad given that there were only a handful of travelers at the station. 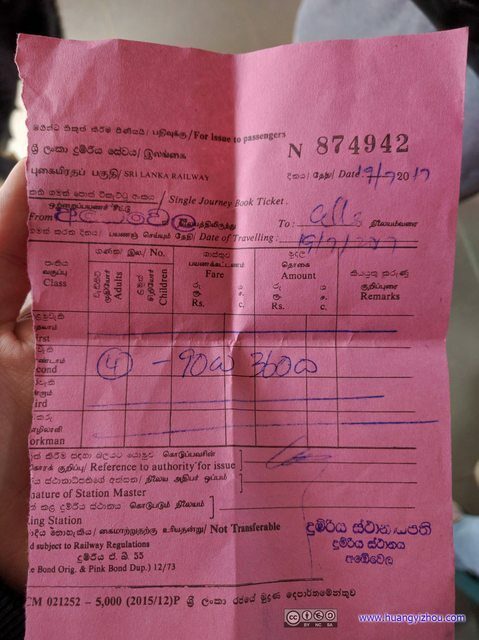 The ticket to Ella ought to cost 90 Rupee (0.6USD) per person, but the guy over the counter sort of wrote a rounded Rupee symbol and attempted to charge us 3600 Rupee for four people. 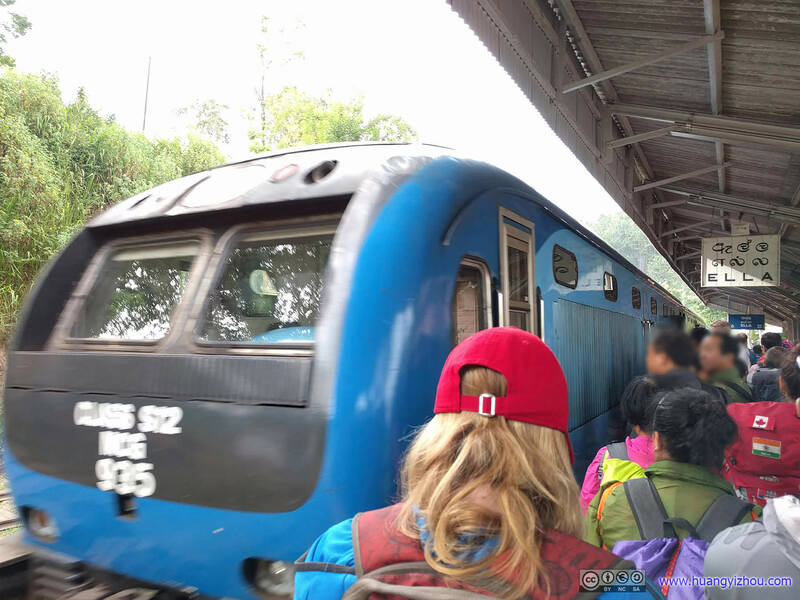 For one minute, we bought into his story and gladly handed him 3600. 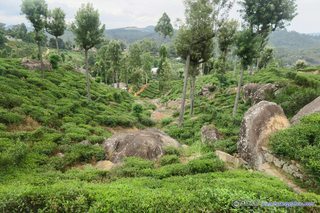 However, after we found out about this (by which time we had left the counter), the guy over the counter without a second word handed us back the change, albeit unwillingly. Which spoke to the nature of Sri Lanka people, I think. Yes, they dream about easy money, especially from foreigners. 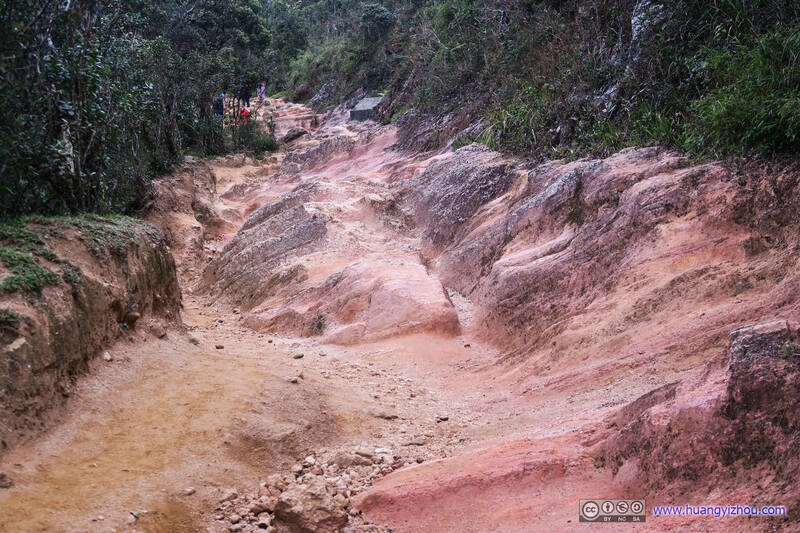 But at the end of day, their good human nature still prevailed. All right, so “exactly” 90 minutes behind schedule, we boarded our train to Ella. 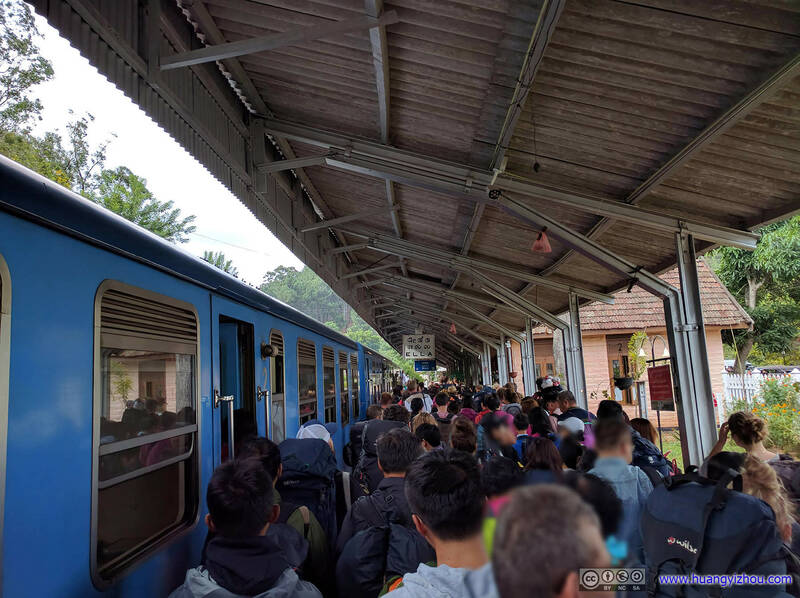 Expectedly, there were no empty seats left. 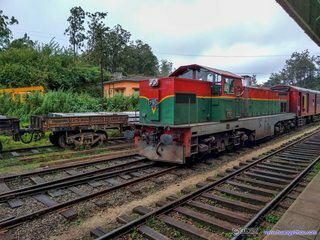 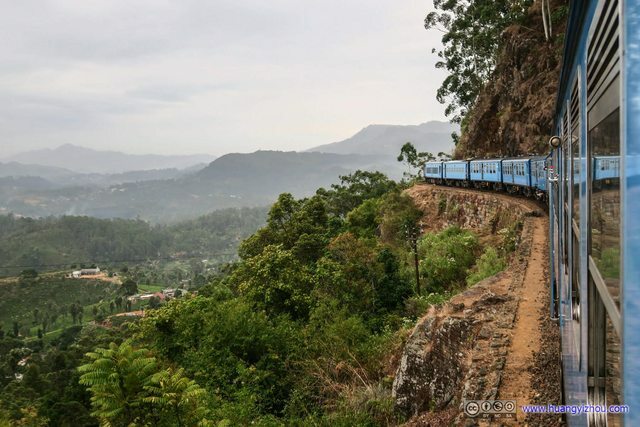 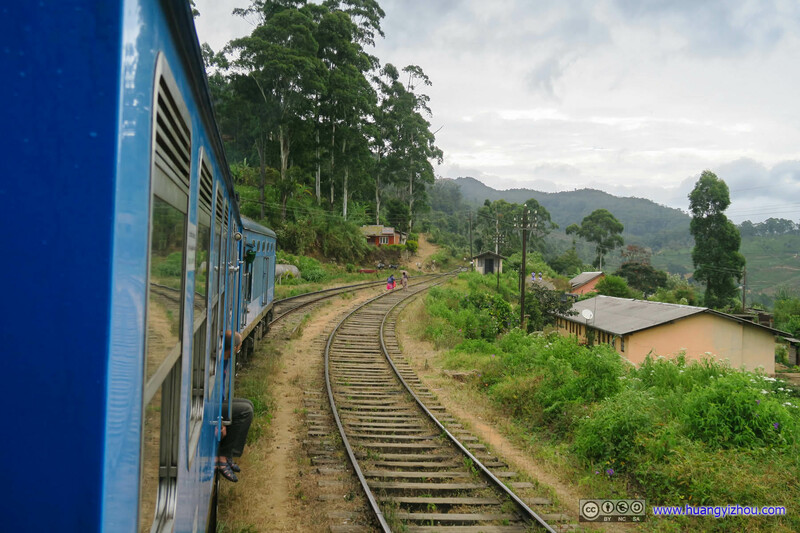 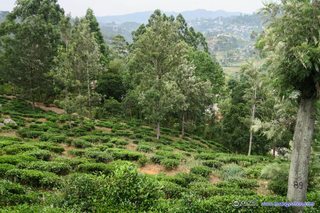 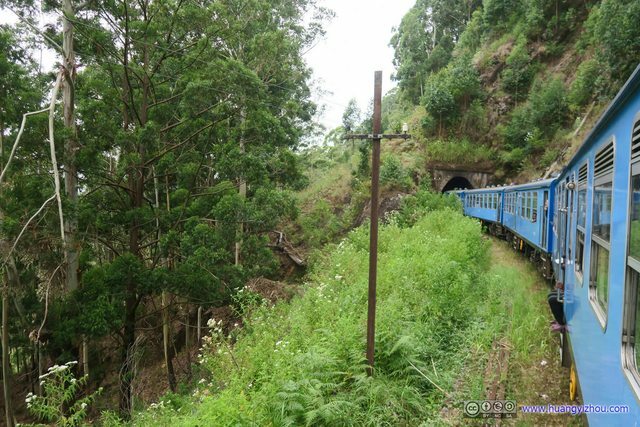 But never mind, the essence of a Sri Lanka train, at least to foreigners, is that its doors don’t need to stay shut as we travel on this scenic leg of highland railway through ranges of mountains and spreads tea fields. 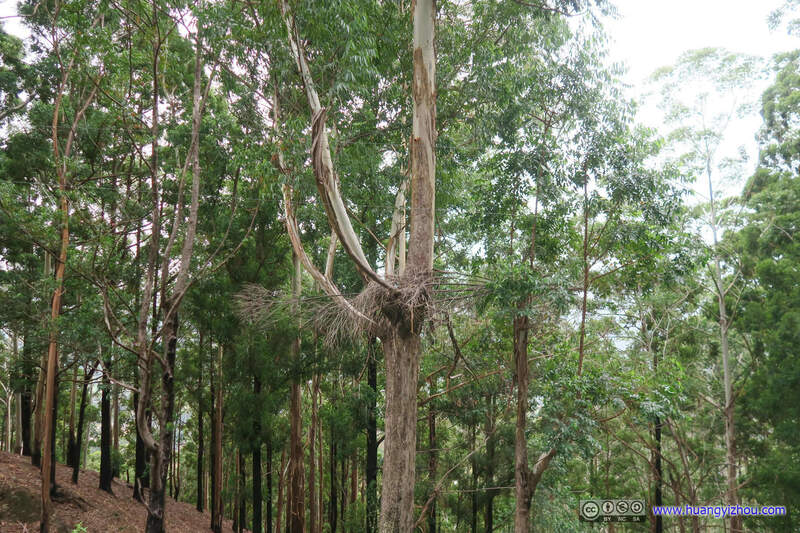 A bird nest right in the middle. 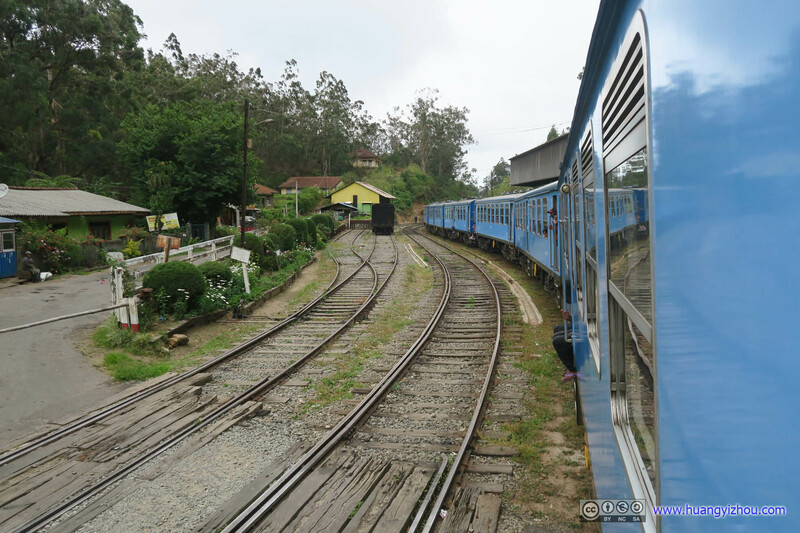 After arriving in Ella, almost everybody on the train got off, which created some traffic jam through the station’s narrow exits. After that, we checked into a hotel that our driver recommended, and that’s basically the end of the day. 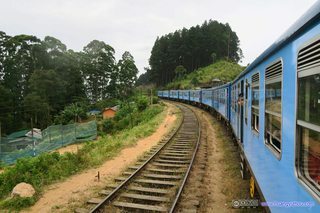 Oh yeah, Ella was a small town, a town made entirely of tourism (maybe a little bit tea production), that meant the town has got some great restaurants that suited our foreign tastes, or, put it in another term, the town’s restaurants knew how to make Sri Lanka food appealed to foreigners. 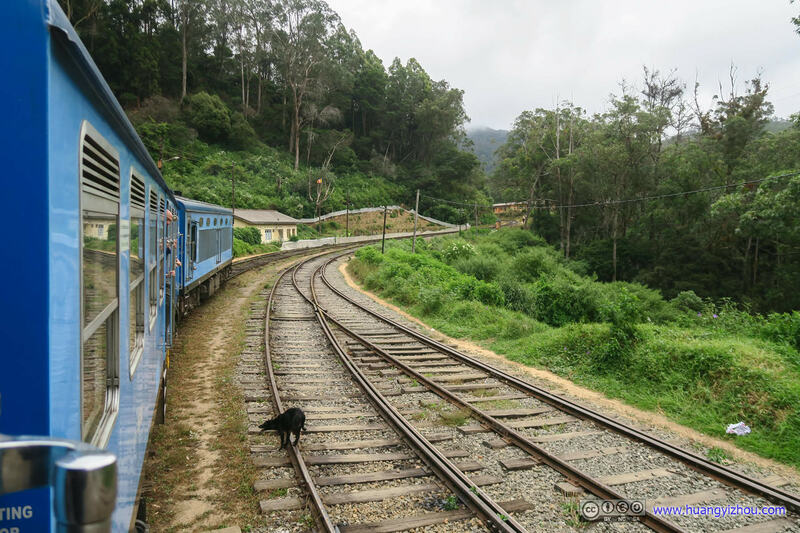 But unlike Negombo where we spent our first night, the prices were very much affordable. 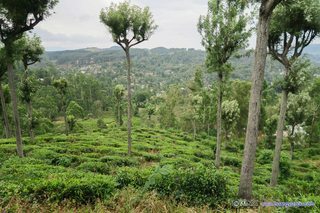 Or, let me put it this way, starting in Ella (which is more than halfway through our Sri Lanka trip), I finally knew what to order in Sri Lankan restaurants (Kottu), and I knew how to enjoy it (tell restaurant “no spice”, then add a little bit spice on my own). 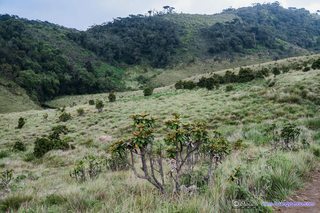 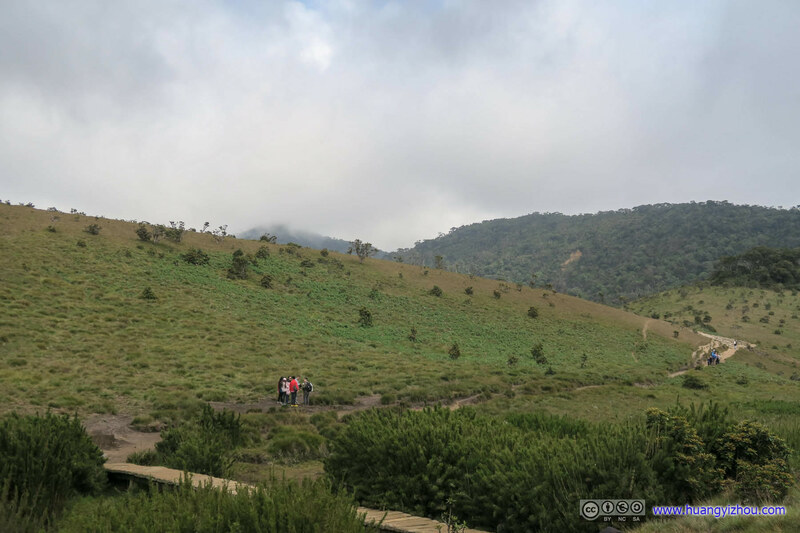 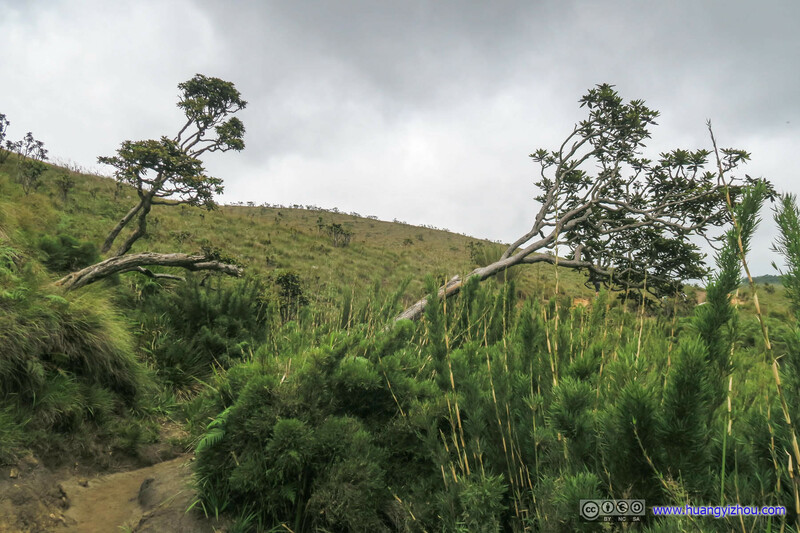 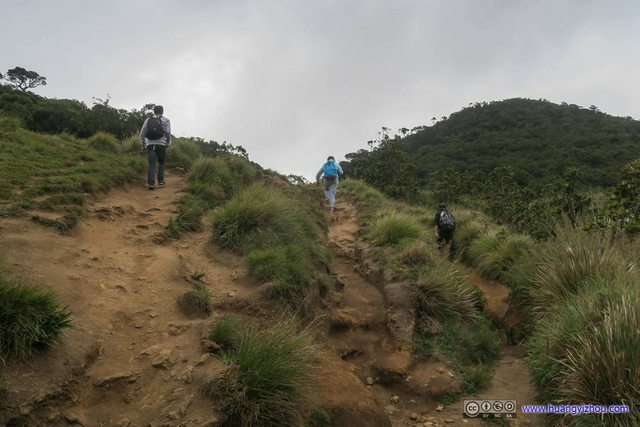 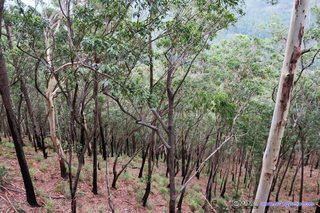 Day 9 of Sri Lanka Trip, Horton Plains Hike on July 19, 2017 by Huang's Site is licensed under a Creative Commons Attribution-NonCommercial-ShareAlike 4.0 International License.